The recently completed project "School Campus Peer" has been published in the November 2016 issue of the Dutch Architectural Magazine School Domein. 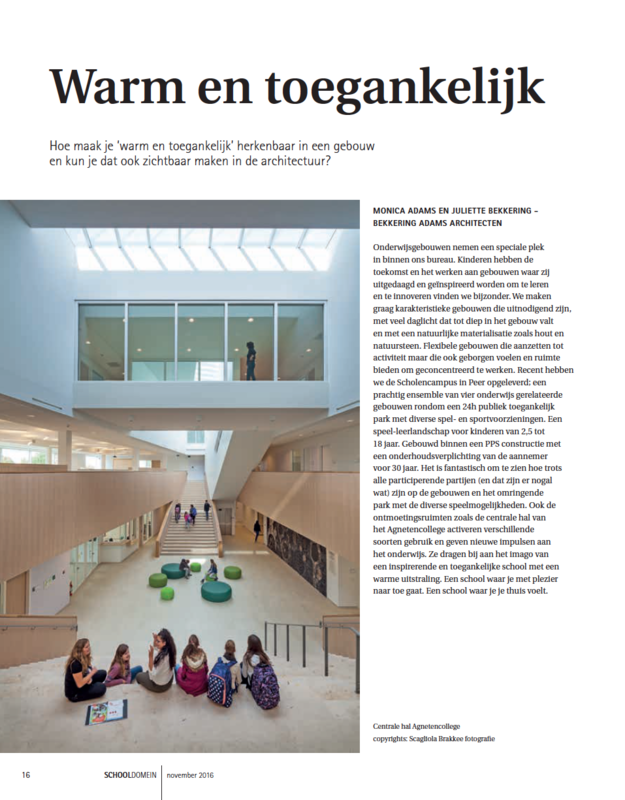 Bekkering Adams architects were asked to give their thoughts about the theme "Warm and accessible" in regards to schoolbuildings. 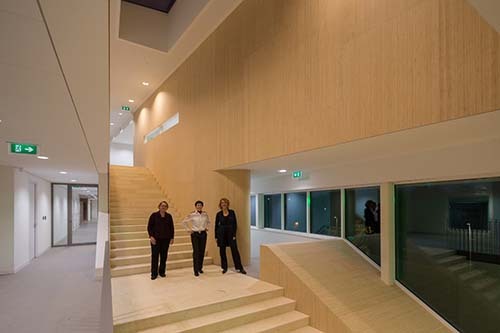 Monica Adams and Juliette Bekkering reflecting on the Agnetencollege on the Schoolcampus Peer, Belgium: We like to make architecture that is inviting, with abundant daylight entering deep into the building, and using natural materials such as wood and natural stone. See here for the article. Thursday December 15 19:00-21:30u – Lecture Room 4, Auditorium TU/e campus. Juliette Bekkering is organizing with the chair of ADE (Architectural Design and Engineering) TU Eindhoven and student organisation AnArchi the lecture series 'Making Architecture'. In this lecture series two architects will each give a presentation which creates an interesting dynamic whereby the audience will be exposed to the visions of two (contrasting) people and possibly become inspired by the mix. 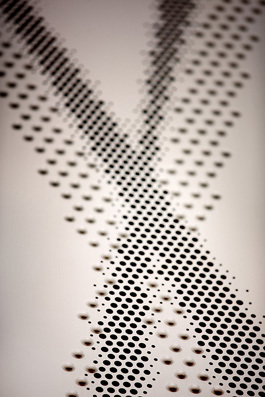 The speakers are asked to illuminate two or three projects or designs. Thursday 13 October Joost Vos from Benthem Crouwel Architects and Elma van Boxtel from Zus kicked of with inspiring lectures in a fully packed auditorium. This month Willem Jan Neutelings from Neutelings Riedijk Architects and Nathalie de Vries from MVRDV will enlighten their working methods. Join in at Double Lecture #2: Willem Jan Neutelings (Neutelings Riedijk architects)/Nathaltie de Vries (MVRDV), November 17th at the TU/e campus. The graduation studio: Public Building for Refugees, led by Juliette Bekkering and Sjef van Hoof at the TU Eindhoven was presented at the Dutch Design Week (DDW) and awarded with the second prize for the best "Social Design Award". Scholencampus Peer School Year has started! Thursday September 1st the users of School Campus Peer have started the new school year. 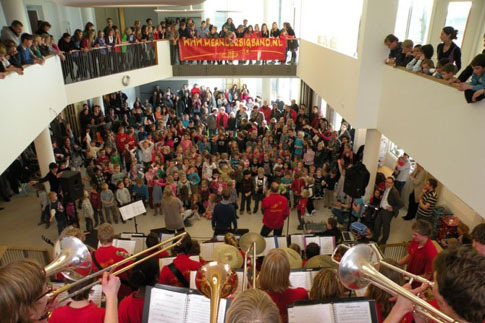 AgnetenCollege, Elementary school mAgneet and Boarding school Agnetendal have welcomed their students with festivities such as a performance in Agnetencollege, using the big theatre stair what it was meant to be for! The formal openening will be on the 30th of September (by invitation only). On Sunday 2nd of October all buildings on the campus will be open for the public. During this summer the users of School Campus Peer have been taking preparations for the upcoming start of the new school year, starting September 1th. Last week AgnetenCollege, Elementary school mAgneet and Boarding school Agnetendal have been busy with the relocation and they are now ready to welcome their students. 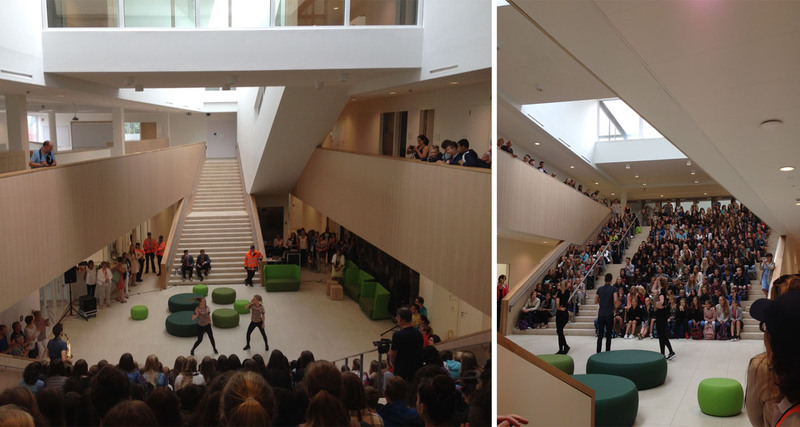 In between all the activities photographer Daria Scagliola managed to make some beautiful shots of Agnetencollege. Ahead of the final photos please enjoy the sneakpreview of the great central hall and the architectural colums accentuating Agnetencollege and the entrance to the public park. Coming Saturday September 3rd 2016, Juliette Bekkering will be guest speaker at the debate about the future of architectural education in the New Institute in Rotterdam. 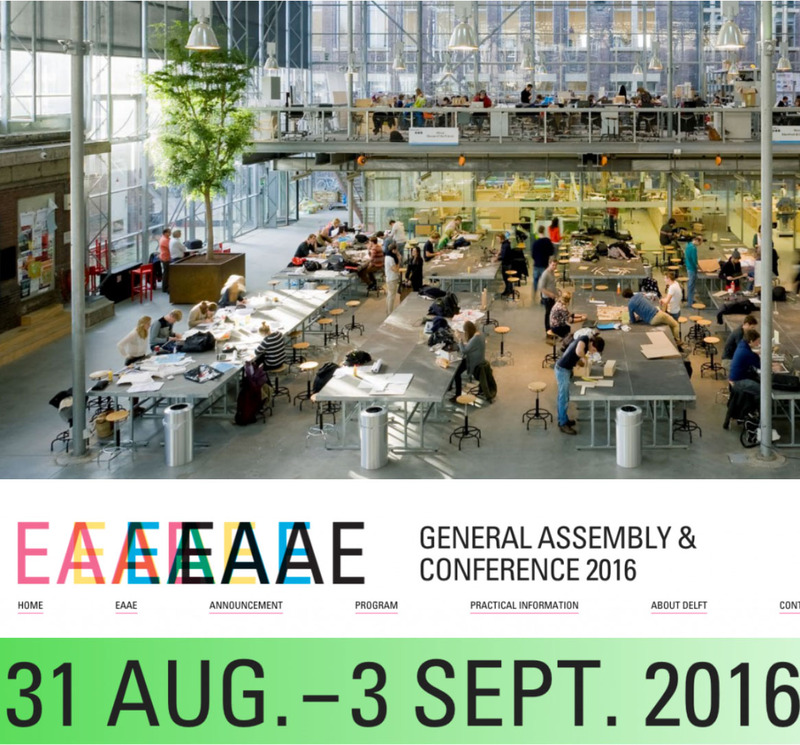 The debate is part of the EAAE Congres EAAE 2016 congres ‘For Example Delft’. Saturday 3 September 2016, Nieuwe Instituut, Museumpark 25, Rotterdam, 15:30 – 17:00 uur. 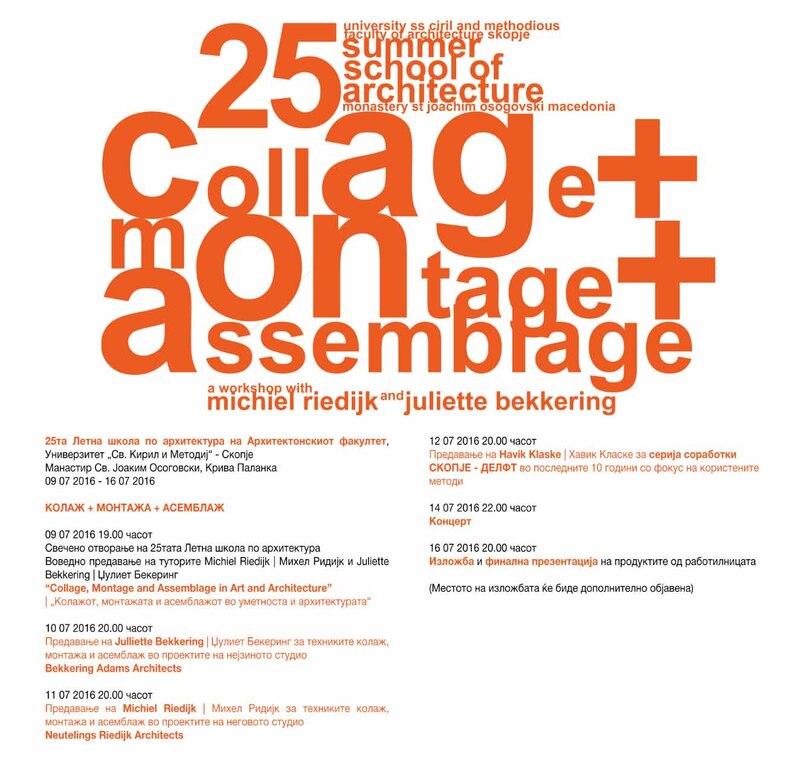 This summer Juliette Bekkering joins the International Summer School of Architecture in Macedonia organised by the Faculty of Architecture of the SS Cyril and Methodius University in Skopje. Together with Michiel Riedijk she will lead workshops and give lectures about Collage, Montage and Assemblage in Art and Architecture, and about the works of Bekkering Adams architects. With the signing of the VBC-contracts by the IM, the execution of the four buildings and its surroundings has come to its final phase. In September the schools will start their lessons in the new buildings and a grand opening is being prepared for the end of September. The publication of Villa het Tolhuis on the Tektoniek website and in the May issue of Cement, emphasizes the use of concrete material in the design and elborates the self-built proces of the private clients. 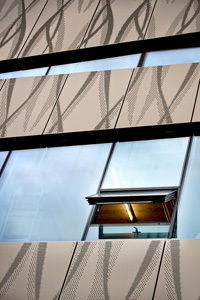 Tektoniek is a trade journal focussing on the use of concrete in the built environment. 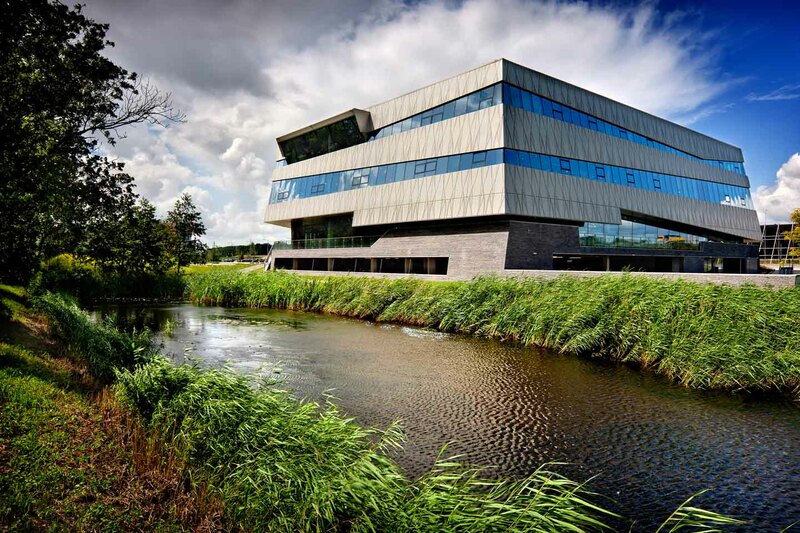 They are aligned with research center Cement en Beton, which is currently involved in the exploring of 3D concrete printing by the TU/E in Eindhoven. Bekkering Adams architects are also involved in this research, with our project-proposal Firewall. 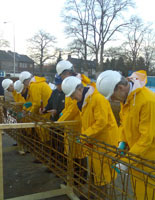 Yesterday the annual Day of the Open Building Site (Open Wervendag) of our School Campus Peer was a great succes. With 2.500 visitors, the expectations were surpassed, resulting in a crowded building site during the whole day. Besides lots of children, posing for a photobooth with on-site building attributes, a lot of inhabitants of the city Peer took a quick peek on the construction site. Our project School Campus Peer started in 2013 and will be ready in time for the fortcoming start of the school year this September. Now that the progress of the four buildings and the overall plan of the School Campus is more visible, it is clear to see that the School Campus will add a whole new educational, social,- and cultural area to the city of Peer. During the official Open Wervendag (Day of the Open Building Site) in Belgium this Sunday 22 May, various building projects on site are open to the public. Also School Campus Peer can be visited. The campus consists of four buildings around a green park. All four buildings and their environment are being built simultaneously. 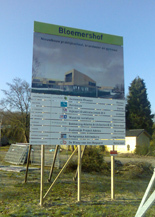 During the Open Wervendag, a route is laid out allowing visitors to view the progression of the secondary school AgnetenCollege and the primary school de mAgneet. On the first floor of Agnetencollege the models of all four buildings are presented, giving a good overview tof the whole area of the Campus. At the end of the tour Scholen van Morgen offers various building site gadgets, and a photobooth to share your Building Site- look online. The building site is open from 12.00 untill 17.00. See the website for more info. During the official Open Wervendag (Day of the Open Building site) on Sunday 22 May, various building projects in Belgium open their construction sites for the public. Also School Campus Peer will open their site to the public. All four buildings are already taking shape. On the Open Day you will be able to visit at least the Primary School. Today, De Scholen van Morgen launches the website for this special occassion. The building site at the Collegelaan in Peer will be opened from 10h - 17h for visitors who are curious to see the works in progress. Last week a group of future students of the School Campus Peer attended an Open Day where there was a possibility to look at the overview maquette of Peer, while being explained the progress of the project by Rik Schepers, who is the chairman of the Building Commity of the Peer project. Due to the work in progress it was not possible to enter the site itself. However even through the fences it is clear that the various buildings are being elevated. See the overview picture and the secundary school Agnetendal shown on the picture below. With most of the structural work in the buildings now almost done. The interior work starting with the mechanical and electrical engineers busy preparing their future work, one of the last but definitely not least structural works was executed last week. In the Sports Complex eight woorden beams were placed. Being 36 meters long, transport took place during the night. Positioning them however went pretty fast. Watch the spectacular moment of placing these 36 meter long elements. Climbing the cranes at the construction site of School Campus Peer gives a wonderfull view on the four buildings which are emerging fast. In the concrete contours the plans of the secondary school, elementary school, sports complex and boarding school are becoming more and more recognizable. Our School Campus Peer is part of the broader movement 'Scholen van Morgen', building 165 schools all over Belgium. Scholen van Morgen has a new website showing more detailled information. 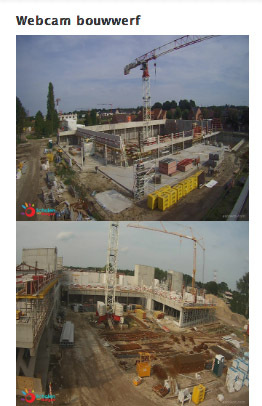 On the website for the project in Peer http://scpeer.scholenvanmorgen.be/ you can see the webcams on all four buildings, and thus see the progress on a daily basis. 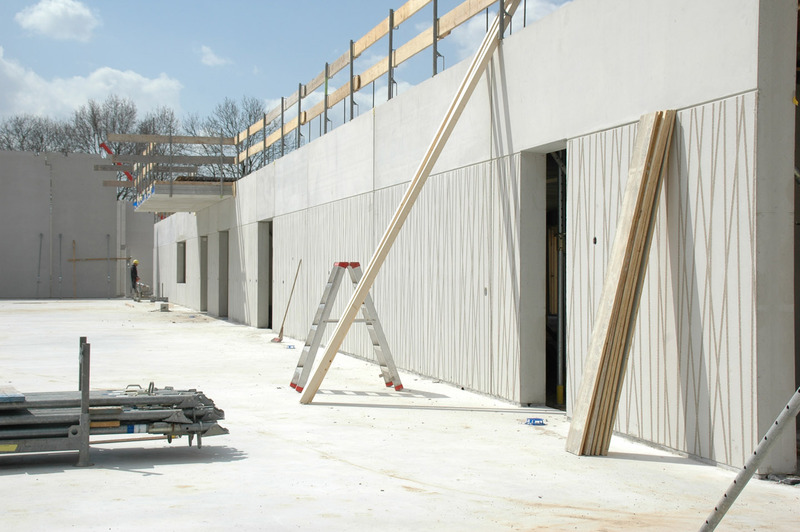 The building site of our Schoolcampus in Peer, Belgium, has been continuously under construction during the summer period. In this period they have started the placing of the blue natural stone, starting at the ground floor of the Primary school and the Boarding school. With this new phase of the building process the facades of the buildings are really starting to emerge. The Schoolcampus consist of a Secondary school, an Elementary and Primary school, a Sports complex and a Boarding school, all planning to finish summer next year. Although programmatically and spacially different, they all share the same architectural language and materialisation. The blue natural stone ground floor is an important aspect in the overall outlook of the buildings. We will keep you updated of the progress! See also the read more section for previous news on the campus. The new campus is progressing and the first sculptural columns are placed. The columns are the first visible signs of the architecture of the new campus. Comments from users and bystanders are positive. The extensive construction site is located near the center of Peer and includes a Secundairy school, Elementary school, Sports complex and Boarding school around a green public park. Expected completion is summer next year. Last Thursday we visited the Belgium Concrete Factory PRETON. This factory will produce thirteen large prefabricated sculptural columns which play a very important role in the appearance of our four buildings, what can be seen on the visualisation of the project. The prefabrication of the first sculptural column, with a rough size of almost four by four meters, will already be finished in less then two months from now. We will keep you updated! Last week during the weekly round at the School Campus Peer, the site was visited by students of the Thomas More College. This visit of the construction site is part of a studyproject in their curriculum. 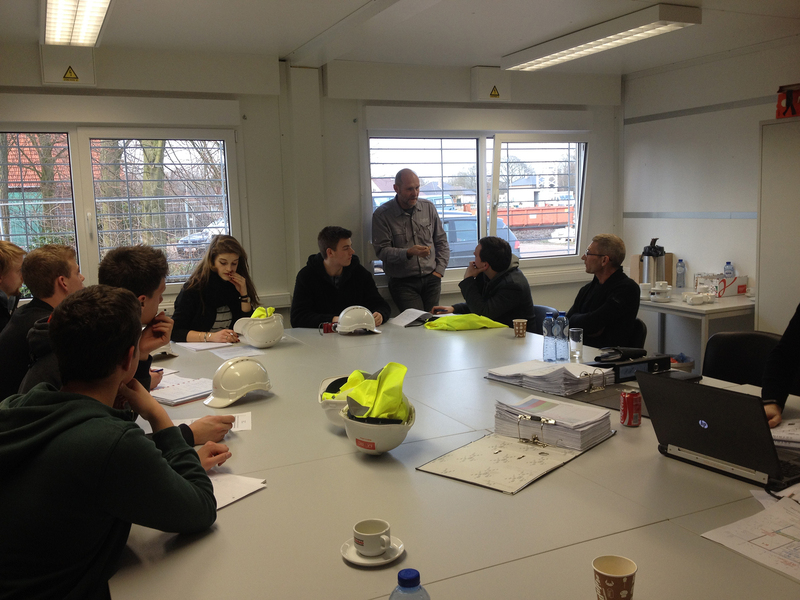 One of the following weeks they will also take part in the the weekly site meeting. The foundations of the Preliminary School and Secondary School of School Campus Peer in Belgium are almost finished and the foundation of the Boarding School is about to start. Although the winter weather wasn't always ideal for building, the execution continued. The ground floor facades of the four buildings will be executed in flagstone. 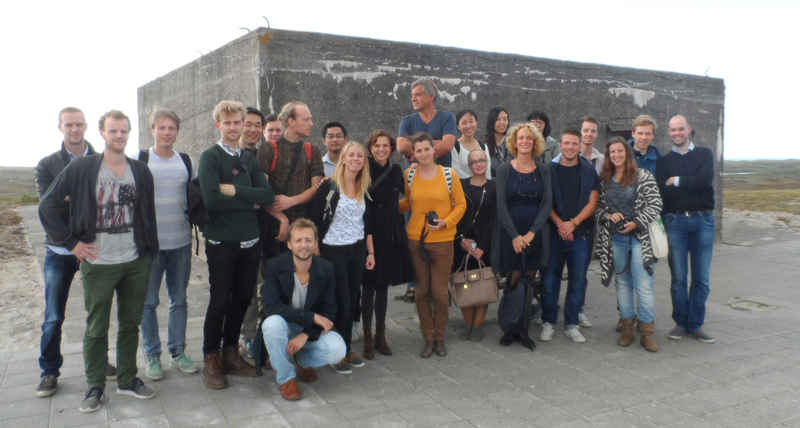 Bekkering Adams architects, representatives of the Schools and client visited Marbor, the flagstone suplier. 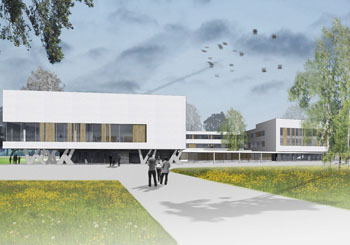 Our project in Peer, Belgium is a School Campus with four buildings: a secondary and preliminary school, a boarding school and a sport complex. The design and build phase started last year after the summer. Simultaneously the construction phase started, which takes place in two phases. Currently the foundation of the Preliminary school is nearly finished and the bicycle storage of the secondary school is being poured. Coming spring the execution of the boarding school and the sports complex will start. The construction of School Campus Peer is on schedule. 139 Piles are drilled and the first concrete floors are poured. The campus will be build in two phases, with the secondary and elementary school starting first. The construction of the boarding school and sports complex will begin in spring 2015. The construction is registrated by four live webcams. Tuesday the 30th of September the Flemish Minister of Education, Hilde Crevits and the Mayor of Peer Steven Matheï, performed the ceremonial handling to celibrate the start of the building activities of School Campus Peer in Belgium, designed by Bekkering Adams architects. All speakers emphasised the value of the new campus; for the schools as well as for the whole population of Peer. As explained by Mayor Steven Matheï great effort was put in the co-operation between the schools and the local authorities. As a result the future campus can be used by the schools as well as by the local community. It will accommodate a sports complex, outdoor sports fields and a central green area open to the public. Flemish Minister of Education Hilde Crevits performed the ceremonial start of the building activities by putting down the first stone. School Campus Peer contains a Secondary school, an Elementary school, a boarding school and sportscomplex designed as a landscaped urban ensemble with sportsfields, playgrounds and a large public park. When finished it will be a green campus for the students and a green heart for the residents of the city of Peer. The School Campus in Peer is part of the Belgium 'Schools of Tomorrow', a major operation upgrading and renewing over 200 schools. Bekkering Adams architects was the first Dutch architecture office who won one of its enclosed competitions. The competition was won together with advisors Bureau Bouwtechniek - general/technical support, ABT for construction and Ingenium for installation advise. The landscape design was executed in co-operation with Bureau B+B stedebouw en landschapsarchitectuur. 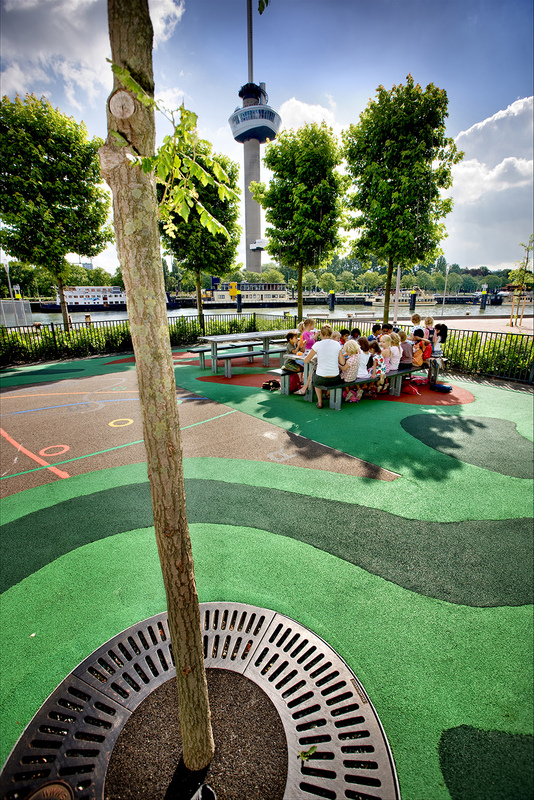 Our project Public Playground at Mullerpier, Rotterdam is recently selected for Active Public Space. This organisation links the forthgoing urbanisation of European cities to Smart Urban Technologies to catalyse sustainable economic development, resilience, and high quality of life. We are proud that Public Playground is selected as an example of progressive, social design, relevant for today's changing cities and public space. Public Playground resulted from a research into the potential of playgrounds for the public domain in 2007. It will be publiced in the catalogue of Active Public Space and presented at the symposium in Barcelona. See also here for info. This weekend IABR (International Architecture Biennale Rotterdam) opens their manifestation The Next Economy. Part of the program is Wake up in Architecture, where visitors can subscribe to stay over at an architect's- or architectural place. Together with De Urbanisten and GROUP A, Bekkering Adams architects invite their guests in the office offering to sleep in a tent for a real 'architectural safari'. The first brave visitors are due to come next week Tuesday- and since they are reporters from GERS! magazine, we will soon find out how their adventurous architectural stay was. Read their experience here. 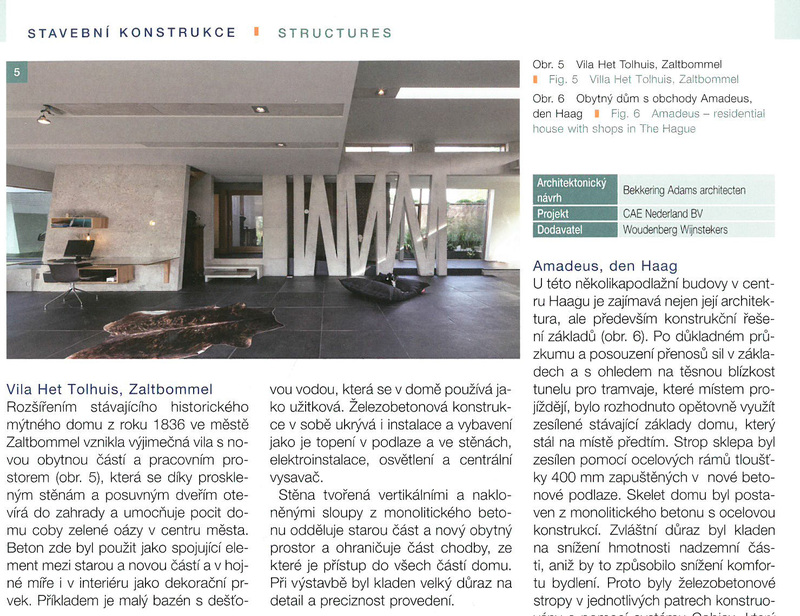 Our latest project, Villa het Tolhuis, is included in the Czech publication Beton, in print as well as online on the corresponding website ASB-portal.cz. The article is a follow up of the nomination of the Tolhuis for the Dutch Betonprijs. The article, named 'Betonprijs 2015: the best concrete constructions in the Netherlands in the last two years', explores the versatility of concrete in general,and within the Tolhuis in particular. The design of Villa het Tolhuis was executed by the owners itself, and it contained large parts of in-situ concrete elements. 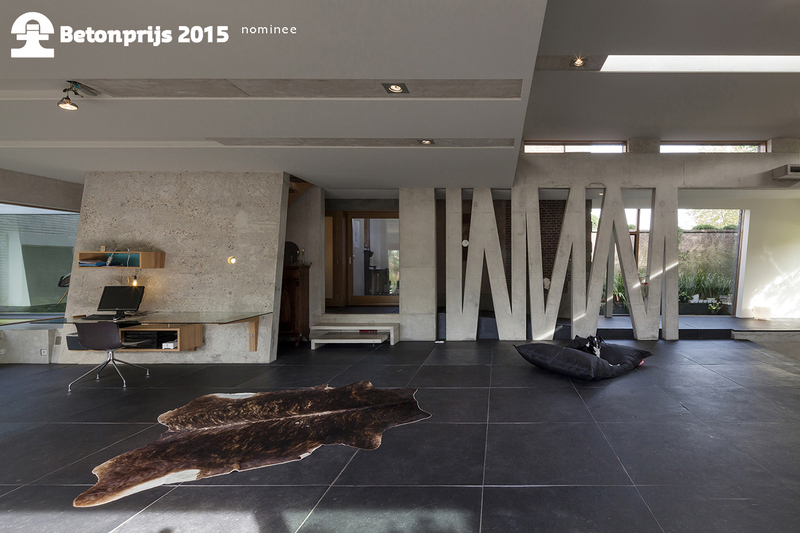 It was therefore nominated for the Betonprijs 2015 in the category 'residential houses'. 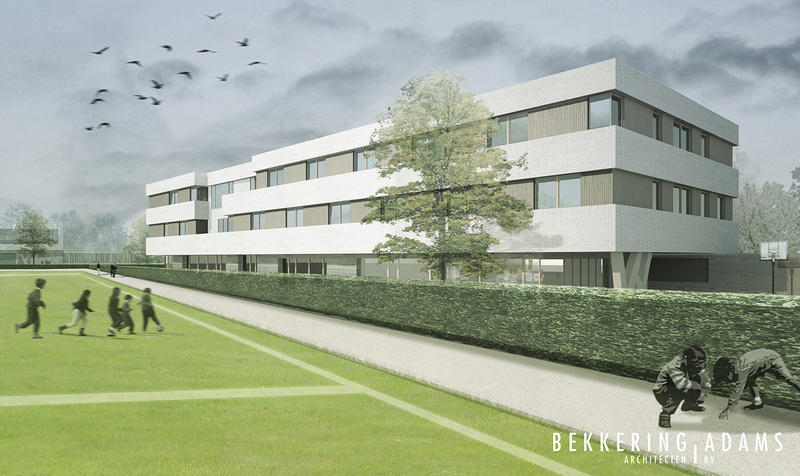 Bekkering Adams architects are designing a zero carbon school in cooperation with De Bouwerij Architects for the Municipality of Evere, Brussels. The building contains a elementary school, nursery school, sports and caretakers house, including the outdoor area with a covered playground. This building is designed as a green oasis in urban surroundings. The school with it's related functions will be an icon for the area where all residents of the neigbourhood can feel at home and relate to. For this sustainable design Bekkering Adams architects and De Bouwerij Architects were advised by Cenergie and Util. Our new office in the M4H area looks out at the 'Voedseltuin" and the premises of renowned Dutch artist Joep van Lieshout (Atelier van Lieshout). This week provided us a sneak preview at some of their characteristic sculptures being prepared for the Art Rotterdam fair this weekend. Early results of the TU Eindhoven research program 3DCP - 3D Concrete Printing - were presented at the Gevelbeurs - Materia 2016. 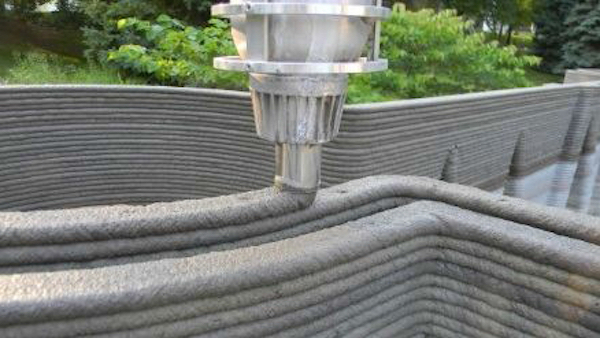 Last September during several workshops the possibilties of 3D concrete printing were explored. For developing prototypes a competition was held, the designs by Bekkering Adams architects, StudioSK and Bierman Henket architecten were selected and presented at the Gevelbeurs - Materia. 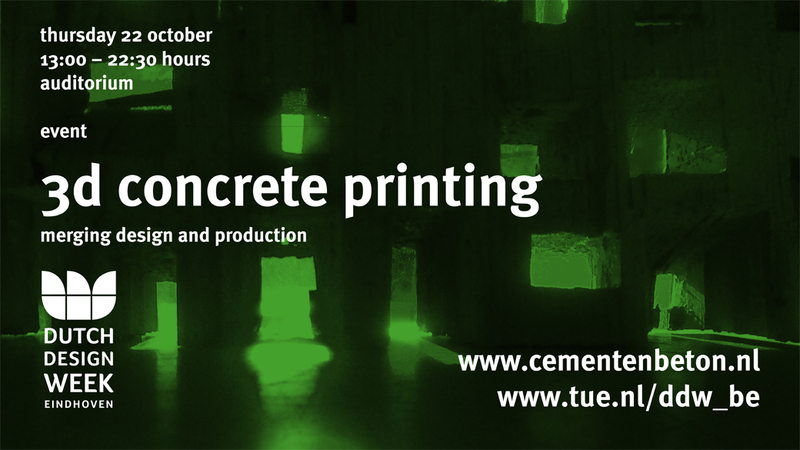 During the Dutch Design Week 2015 the TU-Eindhoven and Cement & Beton Centrum will present the ambitions and opportunities of the research program 3DCP - 3D Concrete Printing. Thursday October 22nd a huge and varied event takes place with presentations, workshops and a marketplace for gathering and exchanging experiences in the field of 3D printing which is developing extremely fast. 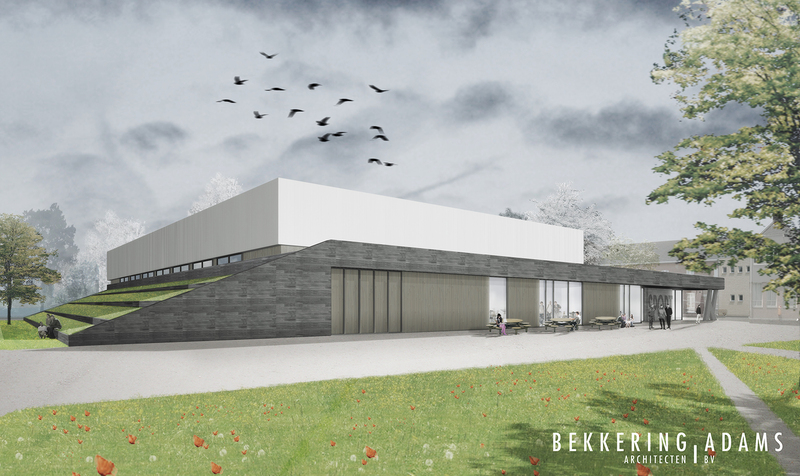 During an earlier 3DCP event in September Bekkering Adams architects did a proposal for an experimental design in 3DCP. At 19.30hrs this design will be presented during the event by Juliette Bekkering. Keynote speakers of the event are Theo Salet - Professor of the Department of the Built Environment, PdD Rob Wolfs, Gregor Zimmermann - research consultant of G.tecz Engineering and Fabio Gramazio of the Gramazio Kohler Research group and Professor Architecture and Digital Production of the ETH University Zürich. October 22nd the TU-Eindhoven and Cement & Beton Centrum will present the ambitious research program 3DCP - 3D Printing in Concrete. A large 3D concrete printer is installed at the Eindhoven University lab - click here to watch the machine being build. The research will be led by prof.ir. Theo Salet of the Department of the Built Environment. 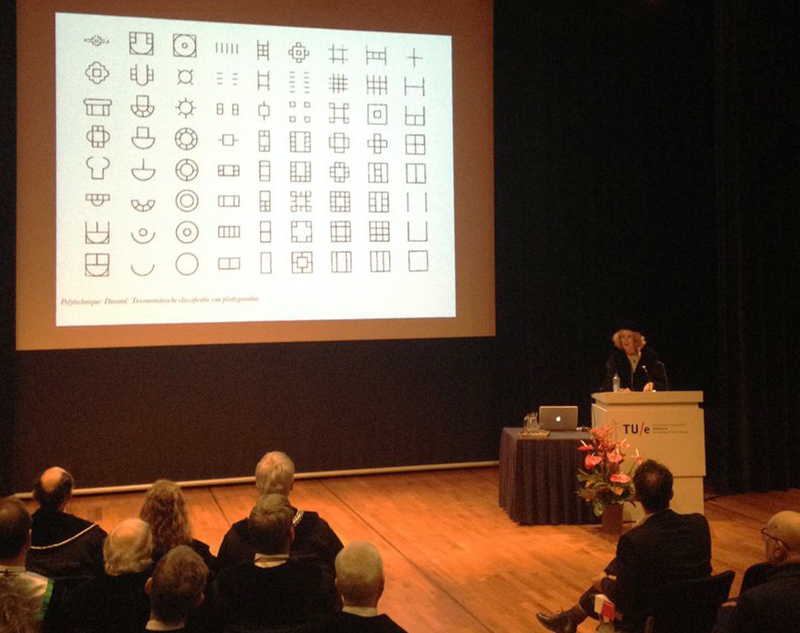 Juliette Bekkering is involved as the Full Chair Professor Architectural Urban Design and Engineering of the TUe. Several workshops are set up to further explore the possibilities of 3D printing. Friday September 18th the third 3DCP workshop took place. The involved architects, structural engineers and material designers were asked to present an experimental design which uses the full potential of 3D printing in concrete. Bekkering Adams architects are also involved and Monica Adams presented our proposal. All designs and proposals will be enclosed and presented during the Dutch Design Week in Eindhoven, October 22nd. The experimental 3DCP - 3D Concrete Printing design by Bekkering Adams architects is part of the TU-Eindhoven presentation at the Gevelbeurs - Materia 2016. Last October the TUe and Cement & Beton Centrum started the ambitious research program about 3d printing in concrete. 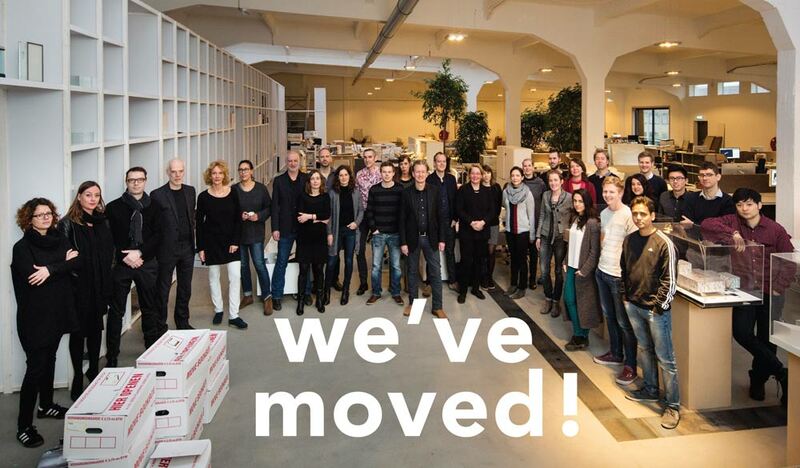 It's official: Bekkering Adams architects and GROUP A moved to a new office at the Keilepand in the M4H area. By the end of the month de Urbanisten will join us. Coming January Bekkering Adams architects will move into a new office, together with co-tenant GROUP A. After enjoying our current office space in the monumental building 'Diepeveen' with its characteristic tower, we feel it's now time to discover and develop a new environment. We are exited to move to an inspiring new studio, situated within the dynamic and upcoming M4H district - Merwe Vierhavens. In this innovative area Bekkering Adams architects will join a diverse mix of companies already situated in the area, such as Atelier van Lieshout, Studio Roosegaarde, Marconia and Studio Makkink & Bey. Together with start-up CleanTech companies and "Making" companies including Buurman - de Bende, de Voedseltuin and Madein4Haven we are fully commited to join them in the creation of a pioneer location for innovation and inspiration. Since the original ware house needed some serious changes before we could use it as an office, the last half year we have been busy to transforme the space into a working space as well as forming the communal welcome area and meeting space. See also the blog by Lolke Ket (Group A) for a weekly update of the work under construction. Coming January Bekkering Adams architects will move into a new office, together with co-tenant GROUP A. After enjoying our current office space in the monumental building 'Diepeveen' with its characteristic tower, we feel it's time to discover and develop a new environment. We are exited to move to an inspiring new studio, situated within the dynamic and upcoming M4H district - Merwe Vierhavens. 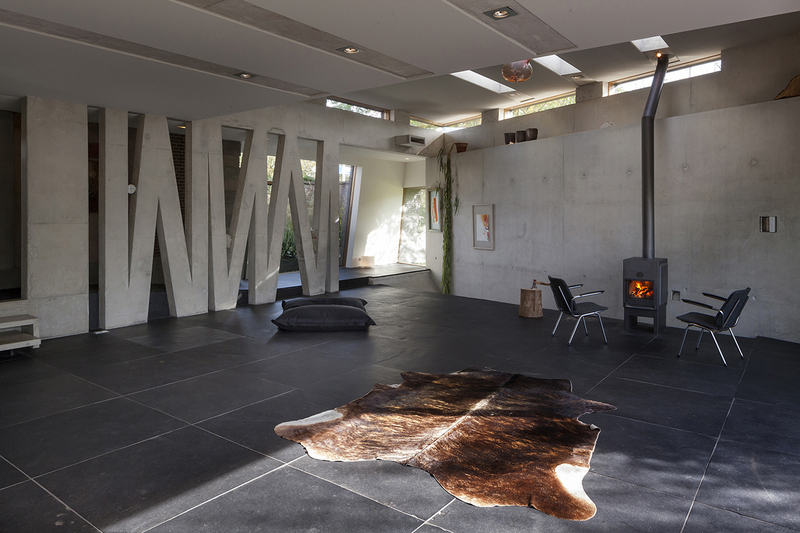 Villa 'het Tolhuis' by Bekkering Adams architects is nominated for the Betonprijs - Concrete Award! This week the winner will be announced at the city hall of Rotterdam. Friday November 6th the Grote Rotterdamse Kunstkalender 2016 was released and festively presented at hotspot Fenixloods II, Rotterdam. We are very pleased about having a Bekkering Adams architects project selected for the third time. The Grote Rotterdamse Kunstkalender 2016 reflects the artistic archievements of artists and architects living and working in Rotterdam. Each day of the year the calendar shows a work of a Rotterdam located artist or designer from the field of art, architecture, poetry, fashion, photography, grafic design and more. The June 22nd page of the calander shows Villa 'het Tolhuis', recently completed and photographed by Daria Scagliola - Scagliola Brakkee Fotografie. Friday Novemeber 6th the Grote Rotterdamse Kunstkalender 2016 was released and is available at the webshop of publisher Trichis. In 2015 Bekkering Adams architects joined the calendar with the the Architecture Biennale Venice 2015 project - FUNDAMENTALS Form-ContraForm and in 2012 with the desgin for Ensemble Bloemershof. Bekkering Adams architects were invited to present their Fundamentals Form:Contra-Form project at the recently held PLDC - Professional Lighting Design Convention 2015 in Rome. The project - developed in co-operation with light designers BeersNielsen was designed originally for the Architecture Biennale Venice 2014. Previously the project also has been nominated for the Best Light Art Installation of the DARC-Awards 2015. During a three day convention PLDC offered a communication platform for established lighting designers, researchers, manufactures, city planners and architects to exchange and share knowledge and new approaches in the field of light and lighting. The Fundamentals: Form-ContraForm was developed with light designers BeersNielsen on the invitation of Global Art Affairs Foundation and supported by the Grant Programme Internationalization of the Stimulerings Fonds Creatieve Industrie. 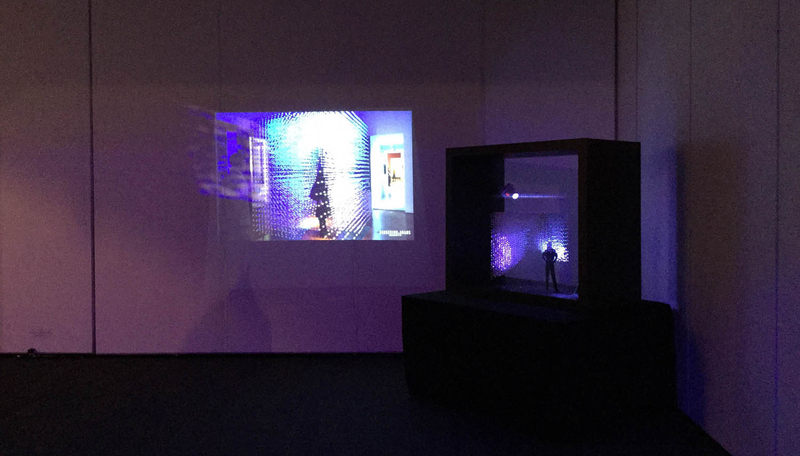 In 2014 the installation has been exhibited not only at the Architecture Biennale in Venice, but also at the Microwave New Media Arts Festivan in Hong Kong. 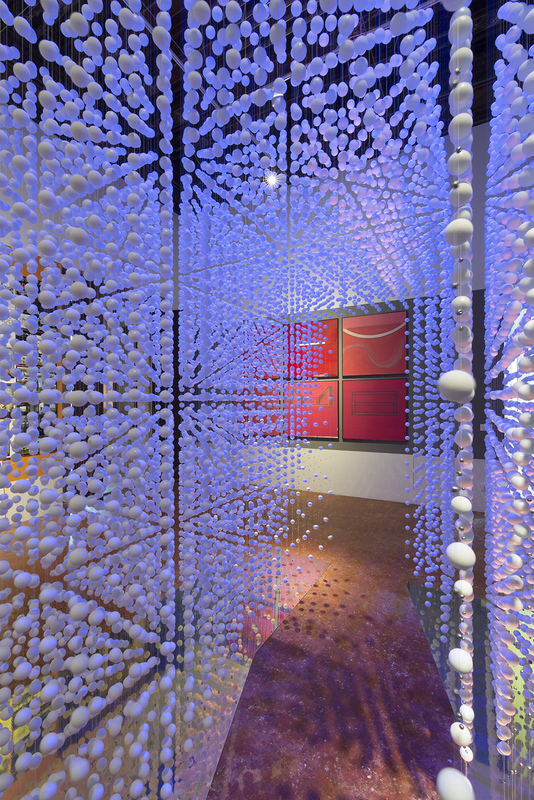 The project was nominated for the Best Light Art Installation of the DARC-Awards 2015. 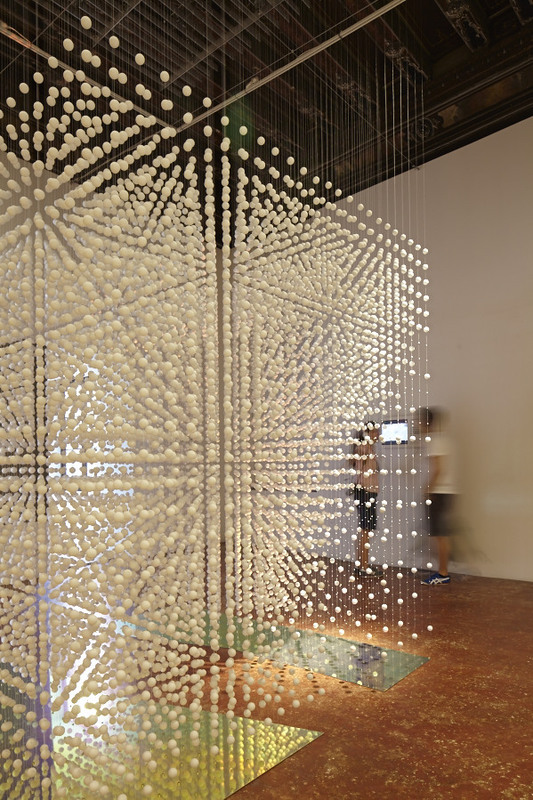 Watch Fundamentals:Form-ContraForm as it was exhibited at the Architecture Biennale Venice 2015 at Palazzo Mora. Thursday 22nd October Bekkering Adams architects presented their poposal 'Fire wall' at the symposium 3D Concrete Printing, organised by the TU-Eindhoven and Cement & Beton Centrum during the Dutch Design Week 2015. We are proud that our proposal has been selected for further research and development with the 3D printer. In the coming period further drawings and tests will be made. 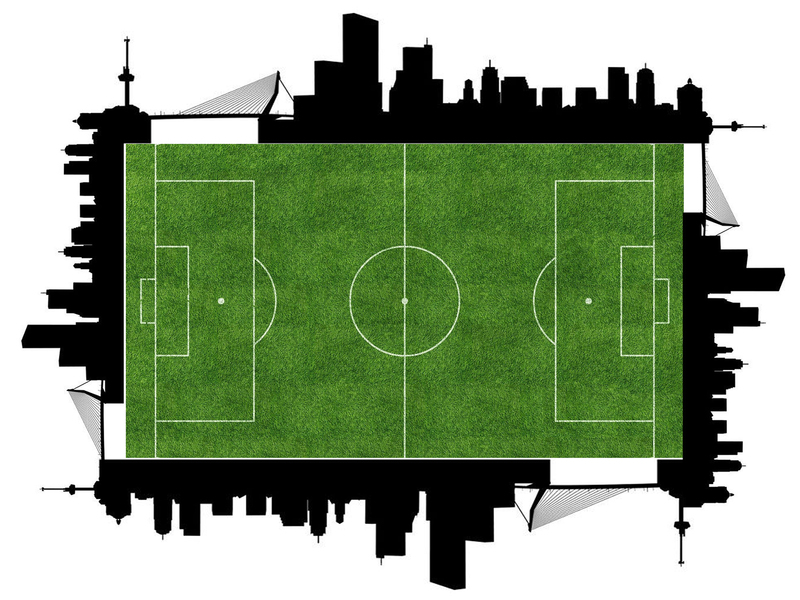 The ambitious goal is to present the first printed experiments of the 'Fire wall' on the 'Gevelbeurs' in January 2016. The one year spent working within the Texel Metabolised graduation studio resulted in the Texel Flows Atlas and 18 Strategies for self-sufficient Texel. Find Texel Metabolised at Dutch Design Week 2015 in the Mind the Step section, Klokgebouw, hall 3. The 18 strategies for a self-sufficient Texel explore various themes that originated in the initial research on Texel's metabolic flows. Check the PDF or watch the presentation explaned by Juliette Bekkering and students. The design for Villa 'het Tolhuis' is a conversion of an existing toll house with working and living areas. This Bekkering Adams architects project is recently completed and photographed by Daria Scagliola. 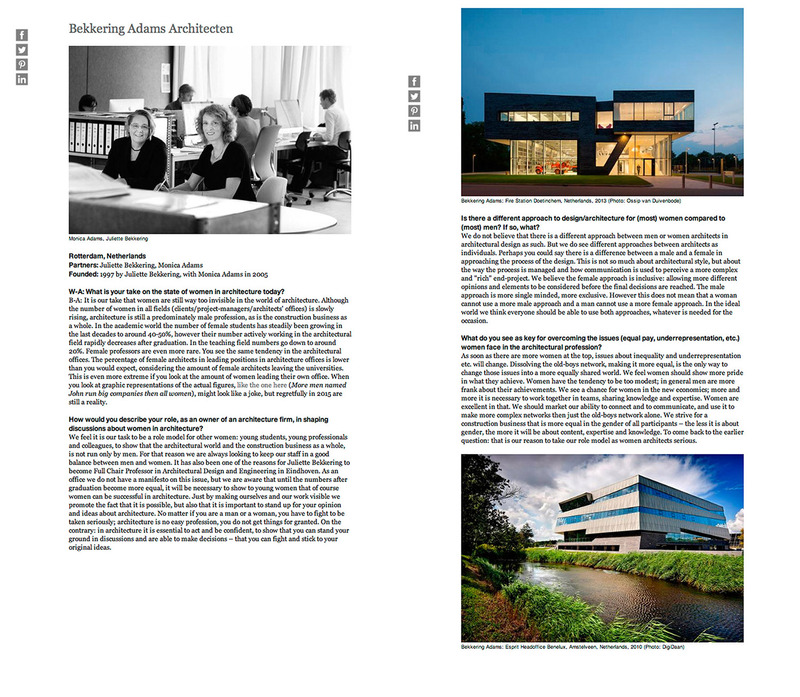 It is published by Harm Tilman in the October issue of 'de Architect' and nominated for the Betonprijs 2015. Click here for more information and data. Or contact us by email info@bekkeringadams.nl of telephone 0031 (0)10 425 8166 for publication material. The Fundamentals Form:ContraForm installation for the Architecture Biennale Venice 2015 is part of the De Grote Rotterdams Kunstkalender. Great weather, good food, a cheerful crowd and above all, fanatic teams: Everything needed to make the Archicup 2015 a succes was available. Last years' winner Power House Company defended their titel in the finale, but the result was 1-0 for MVRDV. Thanks again everyone from GROUPA en Bekkering Adams architects who was involved in the organisation this year. It will be a difficult one for OMA next year to beat that one! Check Architectweb for more about the Archicup 2015. Our Schoolcampus Peer is part of the broader movement 'Scholen van Morgen', building 165 schools all over Belgium. The qualification of Oranje for the UEFA Europa League might be undisputed. But for 13 architectural offices the Archicup Rotterdam 2015 is a fact! Organized by GROUPA and Bekkering Adams architects the competition will take place Saturday September 12th at the Henegouwerplein. The competition will start at 10.30 hrs with last years' winner Power House Company against MVRDV. Other teams: Broek Bakema, De Zwarte Hond, Hoogstad, Groosman, KCAP, Mecanoo, Nov '82, OMA, West 8, ZUS and RAVB. The Archicup Rotterdam 2015 is sponsered by Alcoa and Komplot. 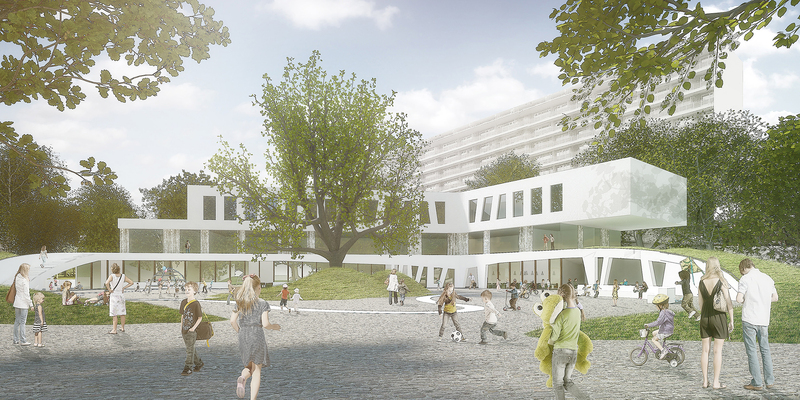 Our submission for a Primary School at Evere, Belgium, is officially chosen by the Municipality of Evere. The project is executed in collaboration with the Brussel-based architecture office De Bouwerij. It consists of an energy sufficient, sculptural and spacious building complex, accommodating children from 2 to 12 years. Next to the classrooms it containsts a sport center, a library and more general spaces to be uses by the community. The competition is established in close collaboration with advisors Cenergie cvba for Mechanical and Electrical engineering and UTIL cvba for Structural engineering. The expected completion for the design phase is 2016. Our project Fundamentals: Form/ContraForm, a collaboration with Light designers BeersNielsen is officially shortlisted for the Best Light Art Installation of the DARC Awards 2015. Professionals vote for each others designs, celebrating the best projects in international architectural & decorative lighting design. The award ceremony will take place on September 24th in London. 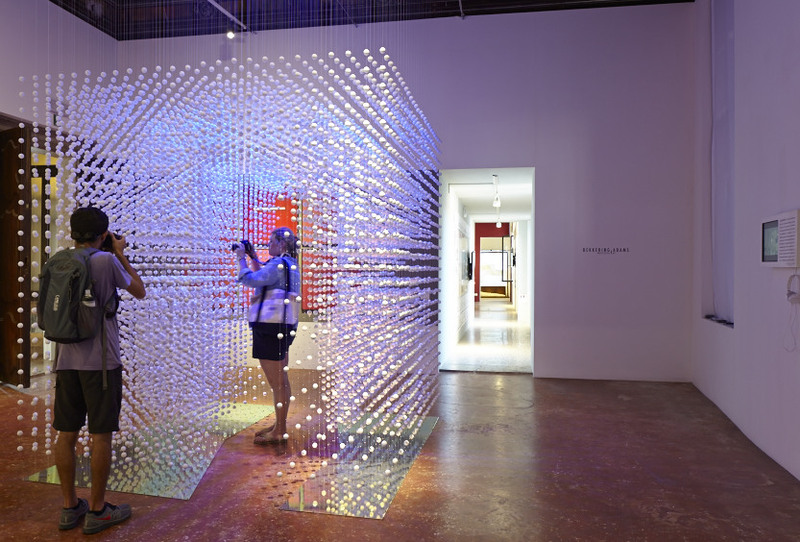 Light designers BeersNielsen submitted our installation for the architecture Biennale 2014: Fundamentals: Form/Contraform, in the category of 'Best Light Installation' of the DARC Awards. This London-based Award Prize is a recognition of the discipline of light design, where participating light designers can vote on each others projects. The winner of the DARC Awards is announced in September. On the 8th of July page of the Archipendium calander the Ensemble Bloemershof project by Bekkering Adams architect is featured. The Archipendium 2015 calander provides an overview of the most fascinating modern developments in contemporary architecture. Each project exemplifies the effort of architects and designers to make life better and more sustainable. Today the polls are open to vote for the most influential woman in property-business (NL) of this year. 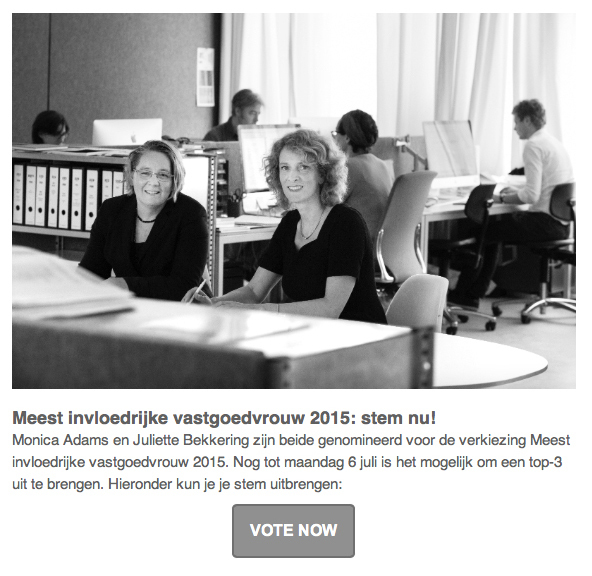 The competition 'Meest Invloedrijke Vastgoedvrouw 2015' includes the nominations of both Monica Adams as Juliette Bekkering, so we have a double chance to win it! You can vote directly here or click on the image below. During the national 'Day of Architecture', it was anounced that our project 'Headoffice Schuurman Group' has won the 3rd prize (juryprize) of the Architecture Informationcenter Alkmaar (AIA). The prize is for the most beautiful building in Alkmaar of the past 15 years. Headoffice Schuurman Group was completed in 2008. During the national 'Day of Architecture', the winner of the AIA-Architecture Prize will be announced. Our project Headoffice Schuurman Group is nominated for this jury- and public prize, proclaimed by the Architecture Informationcenter Alkmaar (AIA). Headoffice Schuurman Group is also part of the accompanying exhibition 'Modern Architecture in Alkmaar', where mayor mr. Piet Bruinooge will name the winner, coming Sunday at 12am. Please feel welcome to join us at the Grote Kerk, Koorstraat 2 in Alkmaar. Thursday 4th of June the exhibition ‘Hedendaagse Architectuur in Alkmaar’ will be opened at the Grote Kerk at Alkmaar around 4 PM. The exhibition is also an election for the ‘most beautiful building in Alkmaar’ of the past 15 years. 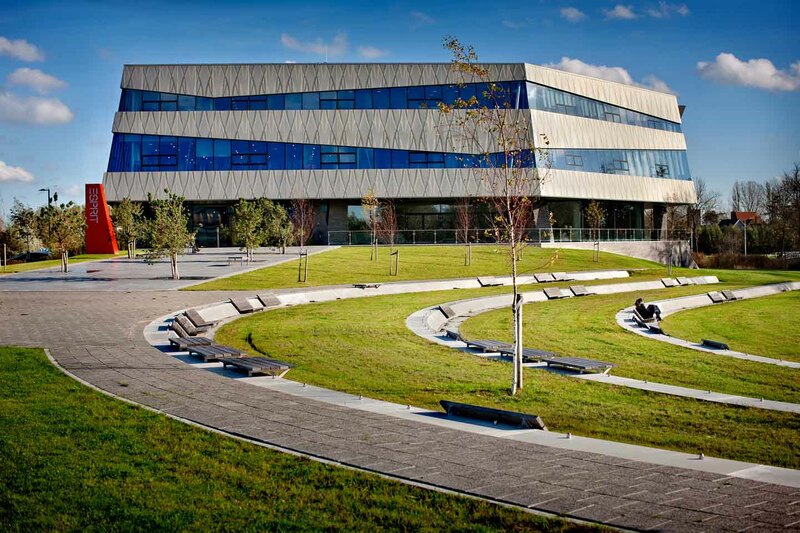 Bekkering Adams architects are nominated with their Head Office for the Schuurman Group. Every visitor of the exhibition can make their vote; during the ‘Day of Architecture’ on June 21st the winner is announced by the mayor of Alkmaar, Piet Bruinooge. So please go see the exhibition and vote for our building at the Grote Kerk, Koorstraat 2 at Alkmaar! On June 5th Juliette Bekkering took part in the leading-group workshop: 3D printing with concrete at the Technical University of Eindhoven. 3D printing is not fiction anymore. In the field of medical technique it is now a reality. 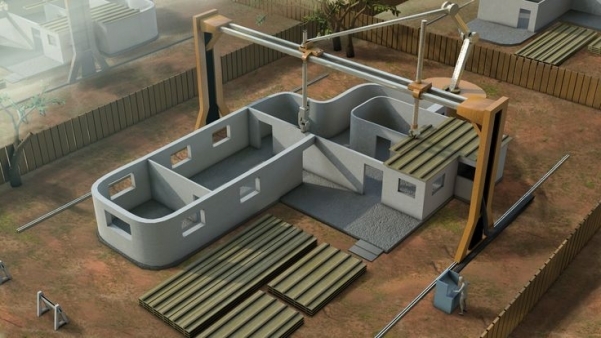 In building-constructions 3D printers are already used for plastic construction products. But 3D printing in concrete is still lagging behind, but catching up. Researchers from the Department of Structural Design and Architectural Design and Engineering, TU-Eindhoven have begun exploring the possibilities. In the coming years the chair of Juliette Bekkering will start a research exploring the possibilities of 3D printing with concrete. The workshop was an initiative of the Cement & Beton Centrum and Booosting in collaboration with the TU Eindhoven. 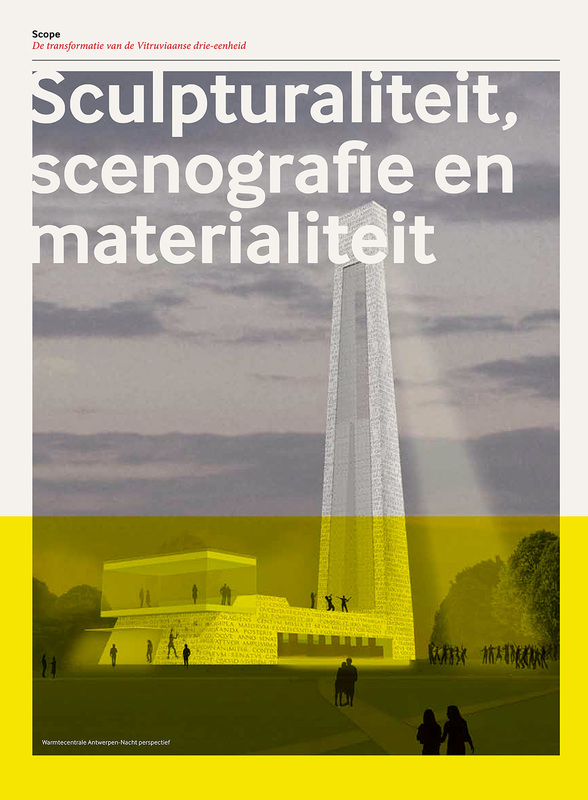 The Dutch magazine ‘De Architect’ published the article ‘Sculpturality, scenography and materiality’, written by Juliette Bekkering, in their May edition. In the article, titled ‘Sculpturality, scenography and materiality’, Juliette Bekkering sketches a reinterpretation of the Vitruvian terms venustas, utilitas and firmitas, better known as beauty, functionality and stability, and how these terms can give meaning to today’s architecture. On Tuesday evening the 21st of April the first results of the TUe Texel Metabolized graduation studio have been presented in a well-attended public presentation in het Dorpshuis in De Koog on Texel. The work was presented to representatives of the municipality, experts from different offices working on Texel and people of Texel. After a short introduction of the studio, the students presented a summary of the work so far: the Planet Texel Guide, the Atlas and the first results of the individual design proposals for Texel and De Koog. The final presentation of the results of the graduation studio will be held in September. An exhibition will be showing the architecturalprojects, the research and the atlas. The Planet Texel Academy (PTA) is an interdisciplinary platform for research, experimentation, knowledge and design where exchange between disciplines is done by means of symposia, lectures, workshops and exhibitions. PTA wants to stimulate a new way of thinking about social issues, based on restored connections with the environment. PTA is cooperating with stakeholders (governmental, societal, NGOs) and scientific institutes such as the Dutch Technical Universities of Eindhoven and Delft. PTA puts forward innovative proposals and strategies that support the ambitions of the island of Texel to strengthen the self-reliance of people and communities. The Architectural Department (AUDE) from the Technical University Eindhoven is participating in the PTA with a graduation studio of 19 students working on innovative ideas for a self-sufficient and sustainable Texel. Focus of the TUe studio is the metabolism of Texel in relation to innovation; hereby the metabolism of the island is researched, and innovative new urban & architectural ideas for De Koog, as well as the island as a whole, are developed simultaneously. Goal is not only to strengthen the ambition of Texel to become a self-sufficient and sustainable island, but also to be the experimental garden where innovation and research play a key role. Bernard Colenbrander, Juliette Bekkering and Barbara Kuit are leading the studio. Tonight, Tuesday the 21st of April, the first results of the Planet Texel Academy will be presented at a public presentation, to the municipality and people of Texel. Prof. Juliette Bekkering will give a short introduction of the studio, followed by Pecha Kucha presentations of the students' innovative project proposals for Texel. In the week of the 11th of May, there will be an exhibition at the TU Eindhoven about a research project called ''Making Architecture'', where Bekkering Adams was one of the researched offices. 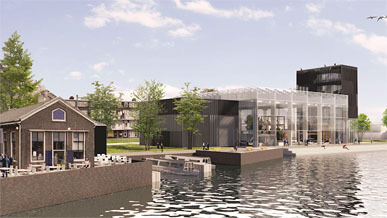 Especially for this occassion 1:1 models were made of the designs of the investigated buildings: Headoffice Esprit, Amstelveen and Scenic Ensemble Bloemershof, Rheden. A finished book of the work will be presented. The exhibition takes place on Plaza of Vertigo, faculty of architecture, TU Eindhoven. The Texel Metabolised Graduation studio follows from the IABR-Projectatelier Texel initiated by Dirk Sijmons, with LA4sale and FARO architecten. The Planet Texel Academy (PTA), is an interdisciplinary platform for research, experimentation, knowledge and design, where exchange is made between disciplines. Focus of the TUe studio is the metabolism of Texel in relation to innovation; whereby the metabolism of the island is researched, and innovative new urban & architectural ideas for De Koog, as well as the island as a whole, are developed simultaneously. 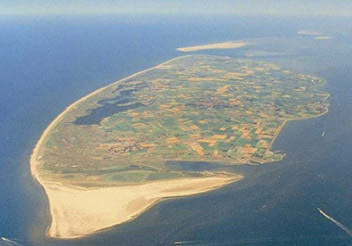 Goal is to strengthen the ambition of Texel to become a self-sufficient and sustainable island. Monica Adams and Juliette Bekkering featured in an article about the role of women in architecture, requested by World-architects.com. 31nd of March at 7pm, Juliette Bekkering lecturing in Moscow at MARCH. 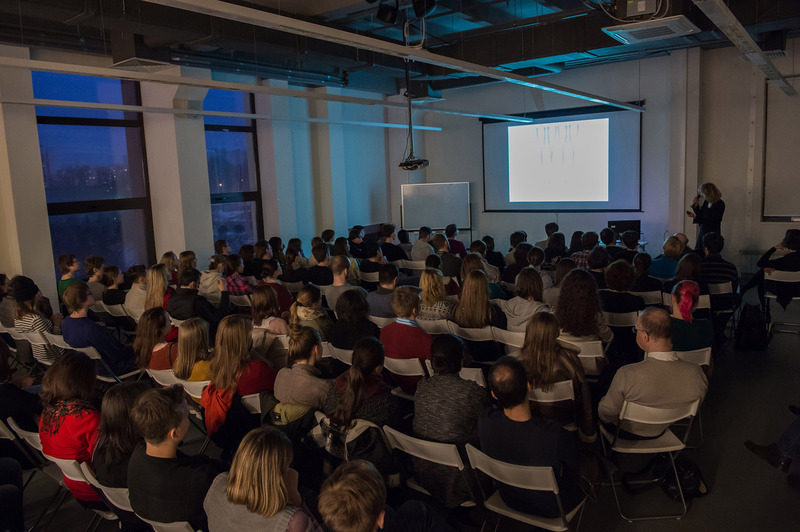 Last Tuesday Juliette Bekkering gave a lecture at the Moscow School of Architecture (MARCH). The lecture was titled: 'Designing Synergy: recent projects of Bekkering Adams' and elaborated on the latest and current projects of the office. See below for some pictures. On the 31nd of March, Juliette Bekkering will give a lecture in Moscow at 7 PM at theMoscow Architectural School MARCH. The lecture titled: 'Designing Synergy: recent projects of Bekkering Adams' will elaborate on the latest and current projects of the office. The Fundamentals Form:ContraForm project by Bekkering Adams architects designed for the Architecture Biennale Venice 2014 will be presented at the 5th Professional Lighting Design Convention in Rome in October 2015. 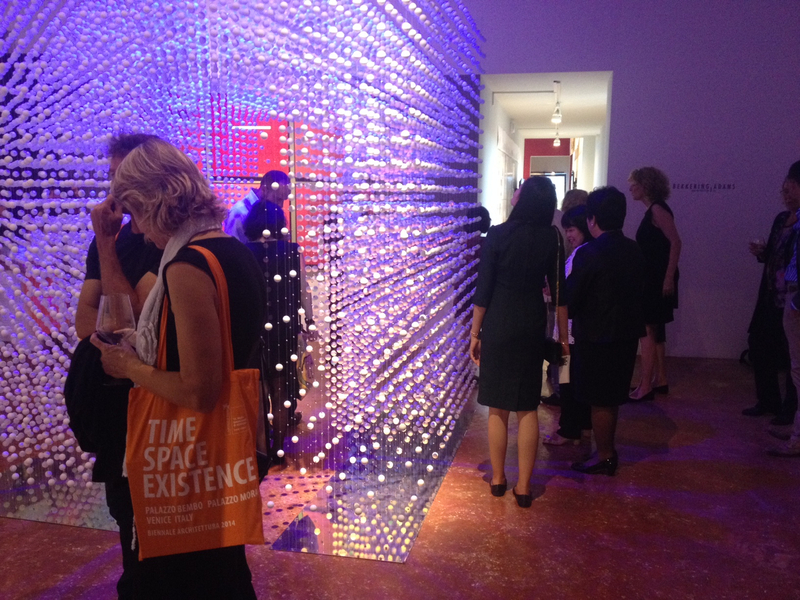 In 2014 Bekkering Adams architects took part in the Biennale di Architettura di Venezia. For this occasion an installation was developed. 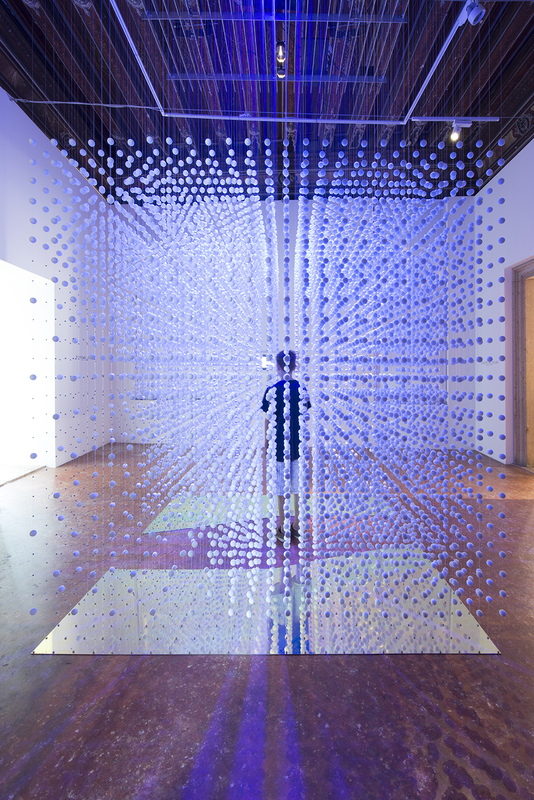 The installation reflects on the concept and perception of space, time and existence. Part of the installation are light projections designed by BeersNielsen Light Designers. A reportage of this project is selected by PLDC for presentation during the convention in October 2014 in Rome. Fire station Achterhoek West in Doetinchem is featured in BOUW Praktijkblad voor de Uitvoerende Bouwsector. Carla Debets interviewed Monica Adams extensive about the sustainable and engineering quality of the design and the building process. Bekkering Adams architects and GROUP A participated together in an Open Call by Vlaams Bouwmeester, Belgium and were selected to enter the selected competition for Agropolis. The project in the Agropolis area in Kinrooi, Belgium requires an urban plan and contains the design of an Agro-tenant building with visitors building, office area, and an aqua-, incubation- and machine building, positioned in a 40 hectare agricultural business park. Last November, after the first registration, Bekkering Adams architects and GROUP A were invited to enter the competion and make a proposal. The deadline is in April. The winner will be announched this summer. Click here for more information about this selection by Vlaams Bouwmeester. This week the Vector Works BIM camp takes place, demonstrating essential BIM tools and work methods in Vector Works 2015. 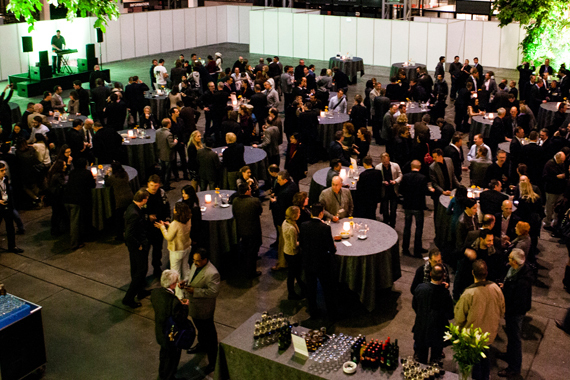 We are proud that our building Headoffice Schuurman Group (© DigiDaan) is used as a brand image for this event. The NL workshops are held in Rotterdam and Amsterdam and are hosted by Design Express. The Belgium event takes place next month in Antwerp. 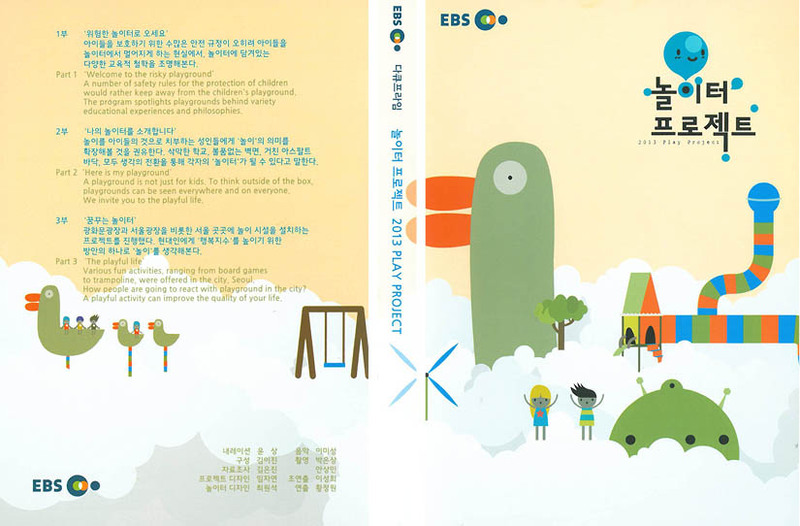 Last year Bekkering Adams architects hosted a Korean television crew of EBS - Educational Broadcasting System - for a contribution of Public Playground to their reportage Play Projects. For this reportage public playgrounds all over the world are analyzed in the context of research about the value of playgrounds in public spaces. The design for Public Playground Rotterdam is a pilot project, resulting from a research by Bekkering Adams architects into the potential of public playgrounds for the public domain. To support the design proces and to communicate with the professional field of architecture, Bekkering Adams architects has a vacancy for a Dutch speaking PR and communication trainee. 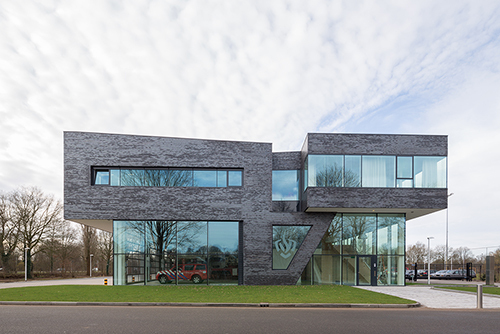 Bekkering Adams architects design for the Fire Station Doetinchem has won in both categories of the 'APA - Architectuur Prijs Achterhoek 2014': The jury award and the audience award. At the entertaining ceremony in the evening of 7th November 2014 it was announced that the Fire Station won both categories. We are more then proud! The ceremony was held in the DRU Cultuurfabriek - Hutteweg 24 in Ulft. The APA is awarded every year to a project in the Achterhoek region. The jury members are: Emmie Vos, Paul Toornend, Gus Tielens, Jan Willem van de Groep, Geert Jan Jonkhout, Harry Harsema and Fons Catau. 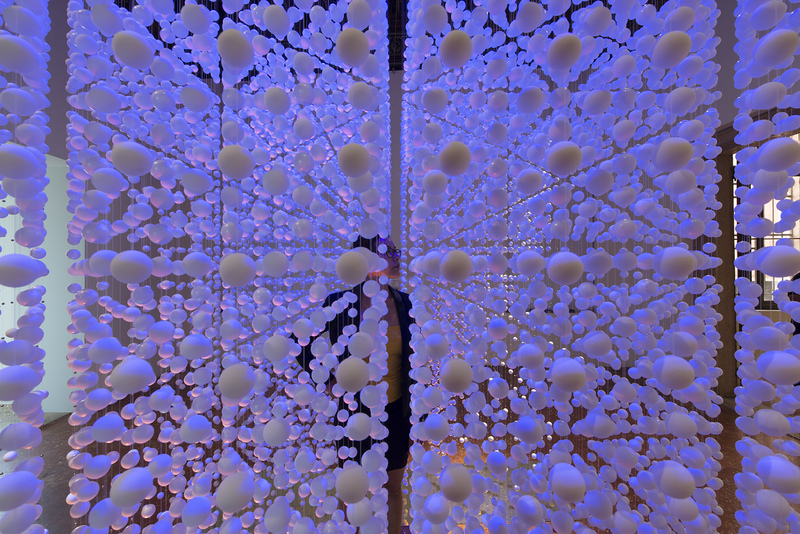 Other exhibitors: Philip Beesley (Canada), Charlie Behrens (UK), Huy Bui & Charlos Gomez de Liarena (US), Caroline Delieutraz (France), Lukasz Karluk (Australia/Poland), Karina Smigia-Bobinski (Germany/Poland), Mathias Woo (Hong Kong), Einar Öberg (Sweden) & System Design Studio: Helbert Suárez Ferreira (Colombia) with Remi Melander (Norway). 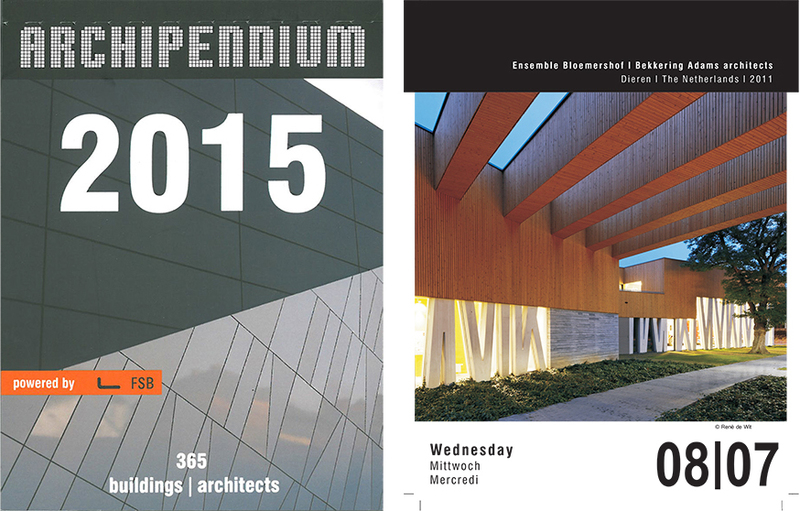 Two projects by Bekkering Adams architects are part of two 2015 calenders. 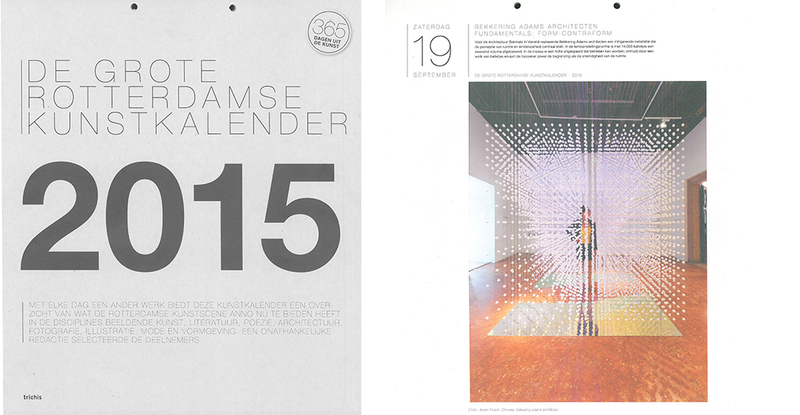 Ensemble Bloemershof on the Archipendium 2015 calender and the Form-ContraForm installation for the Architecture Biennale in Venice on the Grote Rotterdamse Kunstkalender 2015. Bekkering Adams architects is represented at the Architecture Biennale in Venice with the installation FUNDAMENTALS:Form-ContraForm. 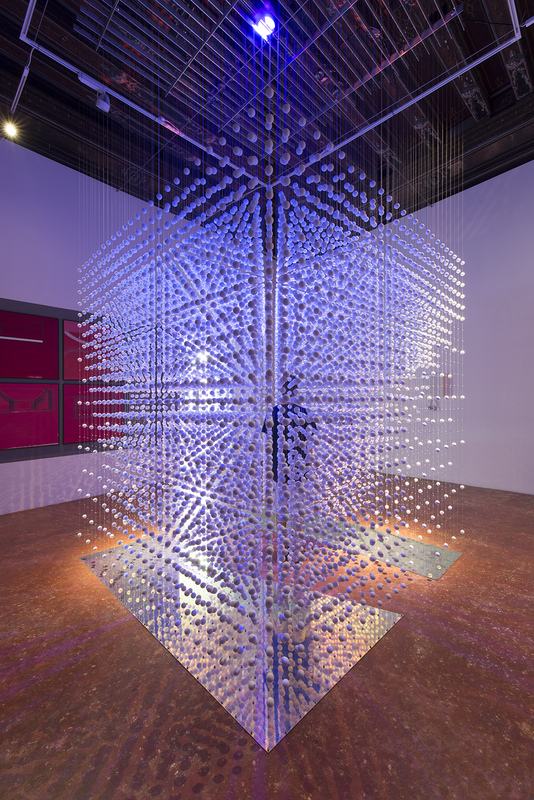 This exhibition puts the definition and perception of space and infinity on center stage. The installation provides an experience that is shaped by the physical boundaries of space, as well as it is extended beyond the tangible. This installation is part of exhibition TIME SPACE EXISTENCE, created by the Global Art Affairs Foundation and financial supported by the Stimuleringsfonds voor de Creatieve Industrie. The design is developed with BeersNielsen Light Designers and structural engineers ABT. The School Campus in Peer is part of the Belgium 'Schools of Tomorrow', a major operation upgrading and renewing over 200 schools. 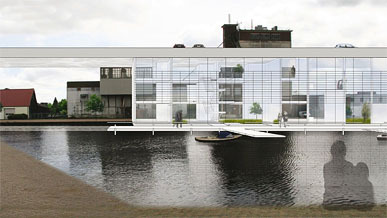 Bekkering Adams architects was the first Dutch architecture office who won one of its enclosed competitions. The competition was won together with advisors Bureau Bouwtechniek - general/technical support, ABT for construction and Ingenium for installation advise. The landscape design was executed in co-operation with Bureau B+B stedebouw en landschapsarchitectuur. This week the graduation studio 'Texel Metabolised' part of "Planet Texel Academy" started of their research for a selfsufficient and autarkic Texel. This TU Eindhoven graduation studio is being led by Juliette Bekkering, Bernard Colenbrander and Barbara Kuit. During the upcoming year the nineteen students of the studio will do research and make architectonical proposals for autarkic selfsufficient Texel. The ‘Planet Texel Academy’ is a spin off of the IABR–Projectatelier and an initiative of TU Eindhoven and TU Delft. Groups of students work under guidance of professors and experts on proposals based on the results of the IABR-Projectatelier. The Texel areas De Koog and Nieuweschild will be the first subjects. 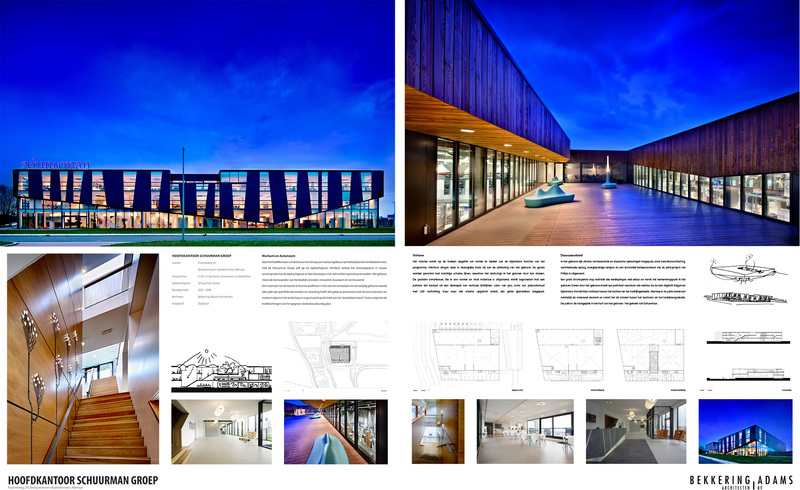 Bekkering Adams architects design for the Fire Station Doetinchem is one of the three nominated projects for the 'APA - Architectuur Prijs Achterhoek 2014'. soon everyone can vote for this award on the website of 'De Gelderlander'. Winners of both awards will be announced Friday November 7th at the DRU Cultuurfabriek - Hutteweg 24 in Ulft. Part of the being nominated is being interviewed at location, new pictures and a movie are made. On the 13th of september the end results of the workshop of the summer school Cagliari 'Cultural Landscapes' were successfully presented in a big exhibition to an international jury and representatives of the city of Cagliari. The jury included Nicola Di Battista, Hans Kolhoff, Juliette Bekkering and Enrica Puggioni, counselor of the city of Cagliari. The evening was concluded with a lecture by Joseph Rykwert and a presentation of Domus magazine. As part of the third International Summer School of Architecture “Sardinia, The territory of places” Juliette Bekkering will give a lecture in Cagliari, Sardinia. Juliette speaks at the invitation of the Dutch Embassy in Rome. She will reflect on the theme of this year's edition, entitled "CULTURAL LANDSCAPES, Projects for an European Capital of Culture 2019". The Summer school adresses related topics to Cagliari’s candidature for the “European Capital of Culture” 2019, and the opportunity tp transform the remoteness of Sardinia into a strength and relocate the richness of its "local" landscape in a "global" perspective. End of August our client signed the final contract for the realization of the project School Campus Peer in Belgium, check website Scholen van Morgen-Agnetendal. This meant the official command for contractor Strabag who started the first of September on the site. Thursday the 30th of September the Flemish Minister of Education, Hilde Crevits, will lead the ceremonial start of the build in Peer, Belgium. The competition was won together with advisors Bureau Bouwtechniek - general/technical support, ABT for construction and Ingenium for installation advise. The landscape design was executed in co-operation with Bureau B+B stedenbouw en landschapsarchitectuur. School Campus Peer contains a Secondary school, an Elementary school, a boarding school and sportscomplex designed as a landscape urban ensemble with sportsfields, playgrounds and a large public park. Bekkering Adams architects is proud of the international interest in Fire Station Doetichem, which is published today on BauNetz. 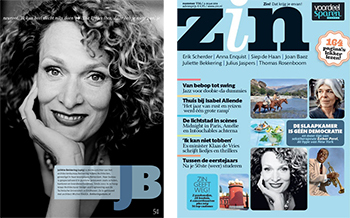 The July issue of lifestyle magazine ZIN includes an elaborated interview with Juliette Bekkering. The article is part of a series of interviews with inspiring people from the Dutch art and culture scene. In the interview Bekkering talks about her background and perspective on her work as an architect. The first two openings of the exhibitions in which Bekkering Adams architects take part at the Architecture Biennale in Venice were a great succes. Please, feel welcome at the two opening party's tonight Friday 6th of June. Join us at the opening of FUNDAMENTALS:Form-ContraForm, One of the two exhibitions of the Architecture Biennale Venice, curated by Rem Koolhaas, in which Bekkering Adams architects takes part. June 5th & June 6th - 18.00 hrs - 22.00 hrs, please feel welcome. 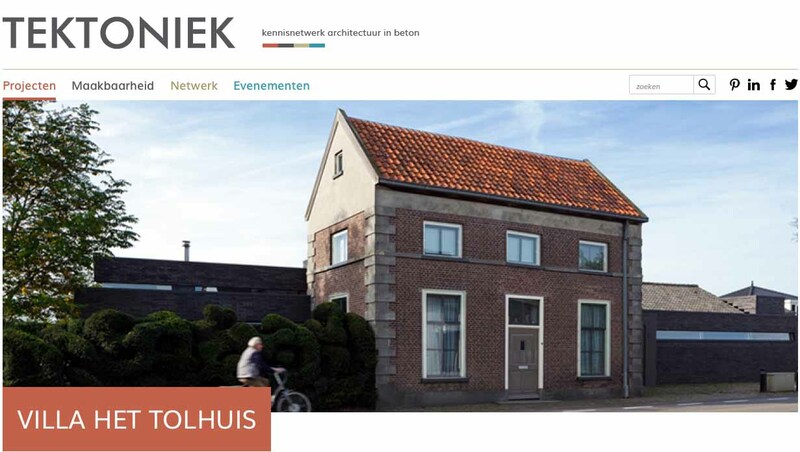 The press conference and preview of the second exhibiton in which Bekkering Adams architects takes part - MORPHOS Sustainable Empires - will be on Thursday 5th of June at 17.00 hrs. The opening of the event will be on Friday 6th of June at 18.00 hrs. 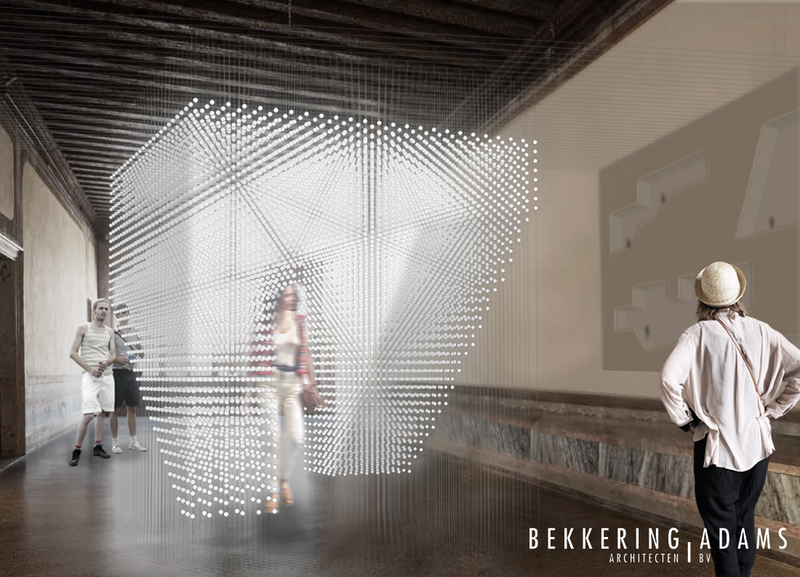 This week the Bekkering Adams architects team arrived at Palazzo Mora in Venice to build the installation out of 14.000 balls and 4,5 km of wire. Bekkering Adams is part of the exhibition MORPHOS Sustainable Empires in Palazzo Albrizzi, and therefore featured in two exhibitions at the Biennale di Venezia! Nearly two weeks before the opening of la Biennale di Venezia Bekkering Adams architects was invited to join a second exhibition at the Biennale: MORPHOS Sustainable Empires. An international event of architecture, photography, video art, installation and performing art, held in Palazzo Albrizzi in Venice. The exhibition is a collaboration of It's LIQUID Group and International ArtExpo. The main concepts of MORPHOS Sustainable Empires are the unifying power of sustainable architecture and the relationship between man and the city. Within this concept the curator Arch. Luca Curci selected Bekkering Adams architects to take part in the exhibition. Two projects will be shown: Ensemble Bloemershof and Booster Pump Station. The installation for the Biennale - Form ContraForm - is gradually taking shape. 14.000 white balls arrived yesterday on Rotterdam airport, shipped to us from China. The steel construction - designed to hold the installation without disturbing the original structure of the Palazzo Mora- is still under construction, but also reaching it's final form. Now we focus on the next step of sewing the balls perectly from within the middle, and solving the transport issue of how to get 14.000 stiched balls to Venice untangled and undamaged.... Solutions are welcome! Hotel Rotterdam - Wake up in it! Monica Adams and Juliette Bekkering are hosts in "Wake up in Architecture". "Hotel Rotterdam, Wake up in it!" is an initiative of Wibbine Kien and Judith van den Berg which promises an adventure and offers a personal match between architect and visitor. Hotel Rotterdam is not a Hotel. Hotel Rotterdam connects to the cultural city-event: IABR: the International Architecture Biennale Rotterdam. Overnight stays in the homes or studios of architects who work in the same subject as this event are offered exclusively for guests of the Biennale. Extra adventurous is the fact that the exact address and architect will only be revealed after registration as a guest. This surprise element is an essential part of Wake up in It. 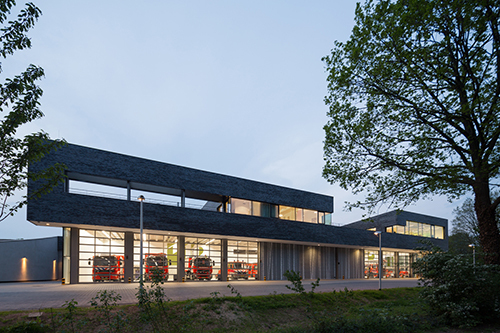 Saturday, April 5th, Bekkering Adams architects latest project Fire Station Doetinchem can be visited during the Open Day organized by Fire Brigade Achterhoek West. The fire station is designed as a villa, integrated in the landscape. It is a green oasis situated along side the major thoroughfare in Doetinchem. The horizontally oriented building is surrounded by majestic trees and has a clear, crisp lines and surfaces. Everyone is welcome to visit the 24 hours operational station, a building wich houses a mix of functions for living, working and sleeping facilities. It has an A+ energy label and is situated next to an important route for bats. Functionallity, sustainability and environmental integration have been the leading design themes during the proces. The festive opening of the Fire Station Doetinchem at Friday March 21st was celebrated with speeches of the mayor of Doetinchem mr. Joosten, chief-commander mrs. Harriet Tomassen and Monica Adams. After the the mayor finished the ceremonial cutting of a rod, visitors could visit the building. The Fire brigade looks back on a very successful day! Bekkering Adams architects will be part of la Biennale di Venezia 2014. The office is invited by Global Art Affairs Foundation, a Dutch non-profit organization that aims to heighten the awareness about the more philosophical themes in contemporary art, to join in on their exhibition in Palazzo Mora. 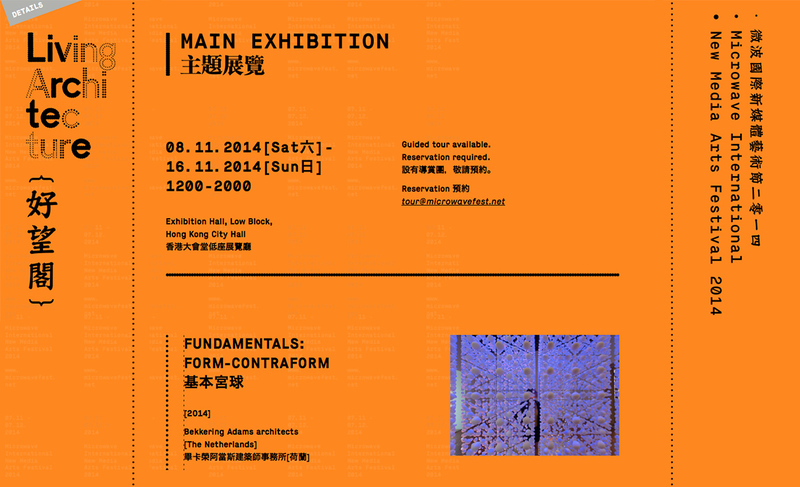 This exhibition is officially part of the Venice Architecture Biennale 2014, curated by Rem Koolhaas. In the coming period Bekkering Adams architects will further develop the exhibition proposal, collaborating with light designers BeersNielsen and structural engineers ABT. The design is supported by the Grant Programme Internationalization of the Stimulerings Fonds Creatieve Industrie. 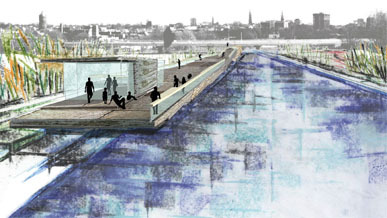 The Victor de Stuersprijs is the offcial architecture award of the city of Maastricht. This award is for an architect, client or institution that has contributed to the cultural heritage or architectural or urban quality of the city of Maastricht. In 1987 the award was invented by the municipality of Maastricht. This year jury members are Fred Humblé, Rene Coenegracht and Juliette Bekkering, who will also chair the jury. Fred Humblé is the last years winner of the award with the design for Lydwinahuis by Humblé Martens / architecture & urban design. Rene Coenegracht, architect and co founder of Vandehoek Coenegracht + Kromwijk and member of the Welstands-/Monumentencomissie 2005-2011. The winner will be announced on the 20th of june. 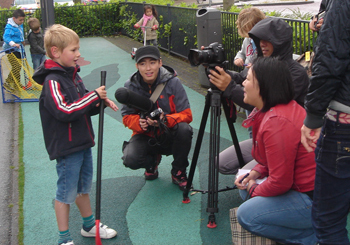 In June 2013 Bekkering Adams architecten hosted the Korean television crew of EBS for a contribution to their reportage ' 2013 Play Projects ' about the value of playgrounds in public spaces in Europe. Head of the primary school 'Mullerpier', Hanny van der Heide and Monica Adams were interviewed about play in general and the design of Public Playground in particular. The childeren of the school were the main focus, filming their play and movements around the square. 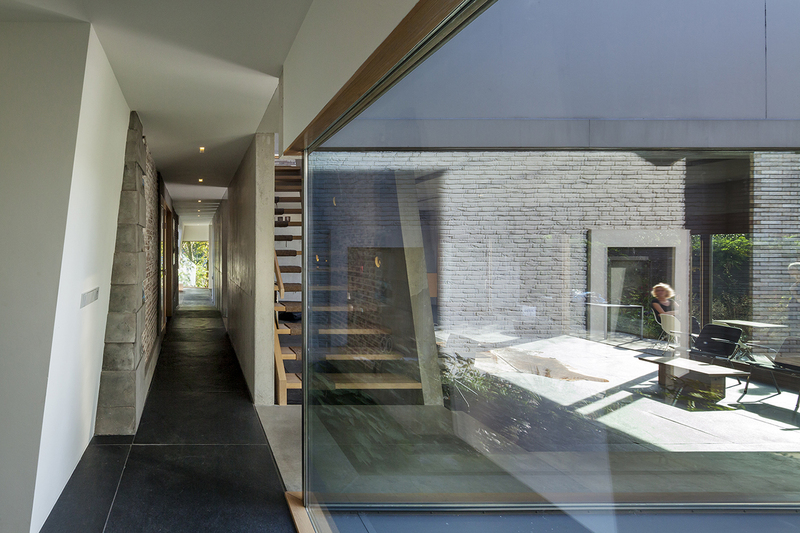 The reportage is finished, the Bekkering Adams architecten fragment will be shown on the website soon. With great interest from the local residents - and the design team of Bekkering Adams of course - all fire trucks of the municipality of Doetinchem moved to the new fire station. 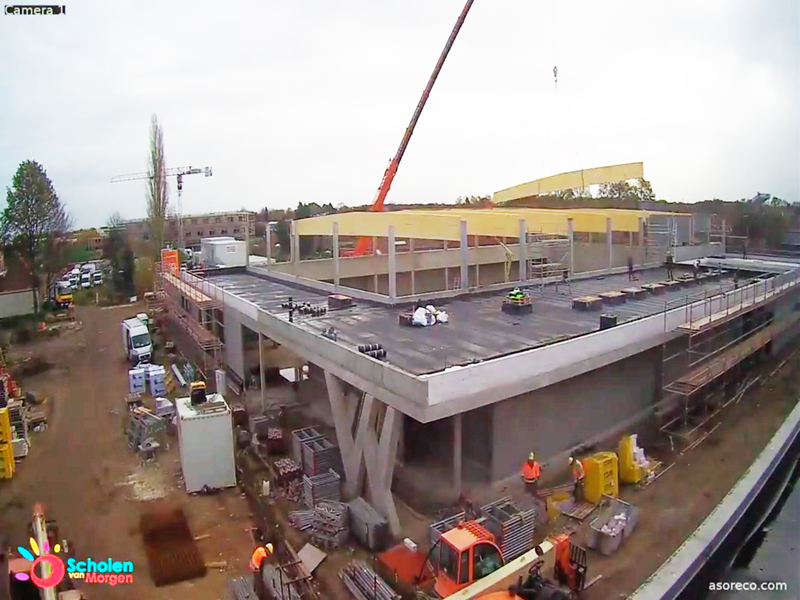 The final completion of Fire Station Doetinchem is heading fast forward. From Januari 1st it will open its doors for the public on its new adress: Stokhorstweg 1, Doetinchem. The completion of the Fire Station in Doetinchem is approaching fast, and Bekkering Adams architecten is proud to give a preview with the following photo's. Note a very proud Monica Adams and Juliette Bekkering together with the fire commander in chief Harriet Tomassen! The jury of Europan Europe 12, in which Juliette Bekkering takes part, will present the results of the 12th Europan competition in the Netherlands. 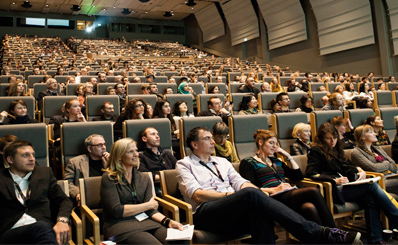 The award ceremony starts at 1400hrs and will take place at Het Nieuwe Instituut, Museumpark 25 Rotterdam. In total 165 teams registered for one of the Dutch Europan 12 sites and 132 of them actually submitted an entry. Sites were located in Assen, Groningen and Schiedam. The adjudication took place in two stages. During the first stage, a part of the jury selected together with representatives of the sites a total of 23 plans from the 132 entries. These were discussed during the international 'Forum of Cities and Juries' in Paris, after which the jury selected two winners, four runners-up and one special mention. For the Amstelveense architectuurprijs 2013 Bekkering Adams architecten were price winning in two panels: One award based on the votes on the website dichtbij.nl, and one awarded by a jury of professionals, chaired by Indira van 't Klooster - Architectuur Lokaal & A10. The evening was presented by Indira van 't Klooster and elderman Mr Levie of the Municipality Amstelveen. The Esprit Headoffice design ended in the top for both awards. Second place for the jury award and third place for the audience award. It was the first time the Amstelveense architectuurprijs was awarded. The municipality means to make this an annual event, in order to stimulate good quality in architecture, the public domain and the build environment. This month Stedenbouw & Architectuur magazine published the interview with Monica Adams about Public Playground; the research Bekkering Adams Architects performed about the importance of public (play) squares and school yards. Author of the interview is Peter Bekkering. Theme of Stedenbouw & Architectuur no 6 October 2013, year 30 is school buildings and it's playgrounds. Other articles reseach theme's such as Education and Sustainability by Liag Architects, Revitalisation of old school buildings by ARCONICO Architects and innovative financing Child care centers. On the initiative of the municipality of Amstelveen an award for architecture is created, the Amstelveense Architectuurprijs 2013. Bekkering Adams architects design for Esprit Benelux Headoffice is nominated. 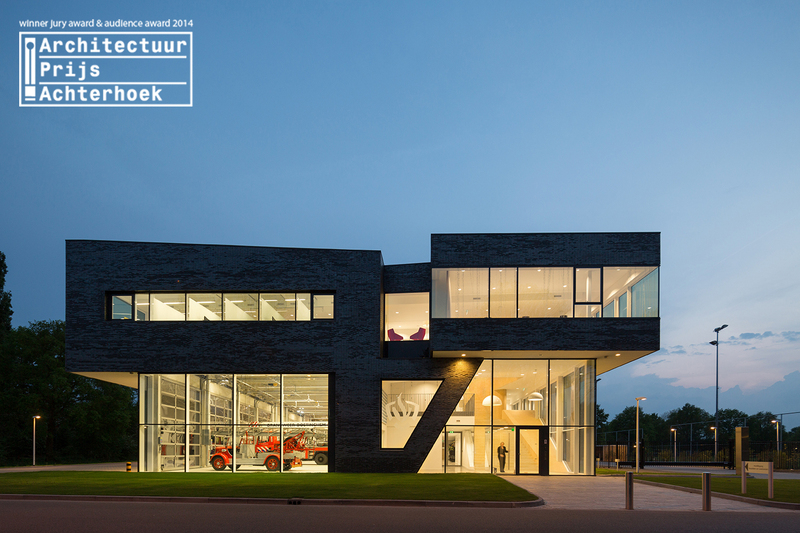 So far Bekkering Adams architecten is on the short list - thanks for all the votes. Next week the winner will be announced. The 6th Concrete Design Competition will be kicked off with a seminar in collaboration with Eindhoven University of technology. The International Concrete Design Competition for Students is a biennial ideas and design competition for students in architecture, engineering, design and affiliated disciplines. It is organized and funded by a consortium of European cement and concrete associations and open for students registered in an educational institute in one of the participating countries. 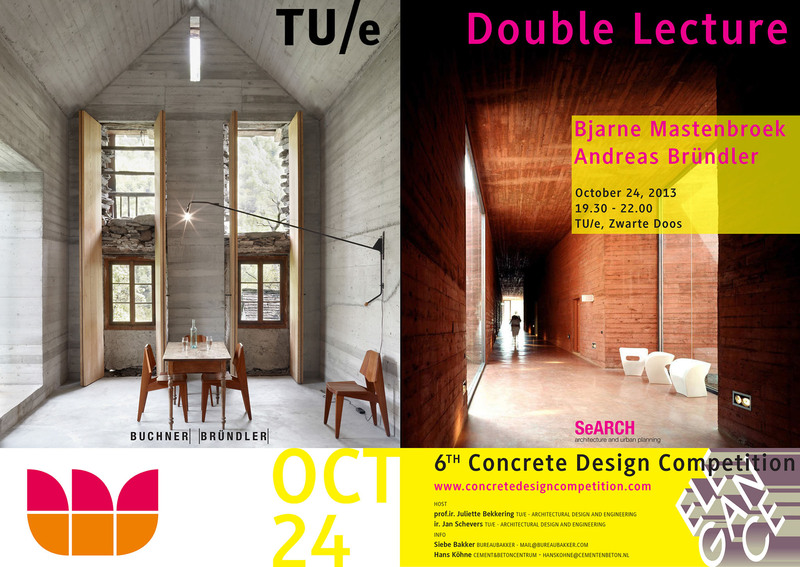 Lecturers of this Seminar are Bjarne Mastenbroek, founder of SeArch Achitecture and Planning and Andreas Bründler, founder of Buchner Bründler Architekten, this years winner of the prestigious Swiss Architekturpreis Beton. Prof.ir. Juliette Bekkering and ir. Jan Schevens - TU/e Archituctural Design and Engineering - will host the seminar. Magazine Stedenbouw & Architectuur will publish an interview with Monica Adams about the research Bekkering Adams architecten did in 2008 about the importance of public playgrounds. 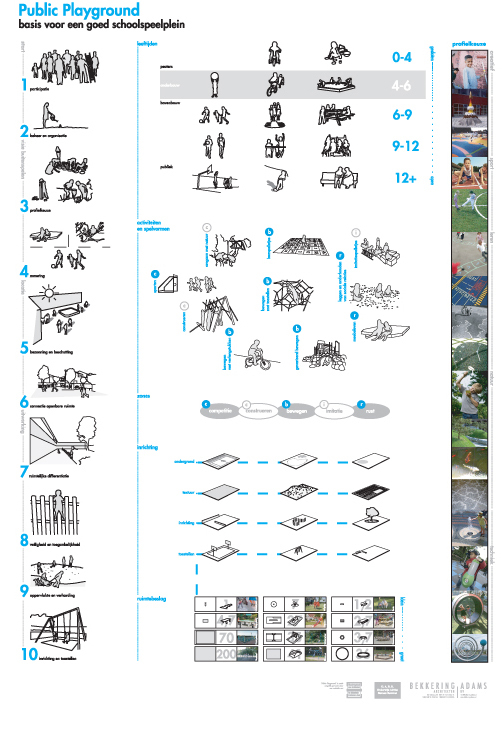 This research resulted in a design for the Public Playground Mullerpier and has been previously published in Lay Out Magazine, and in several international books about Play grouns and the Art of Playing. On the initiative of the municipality of Amstelveen an award for architecture is created: the Amstelveense Architectuurprijs 2013. Bekkering Adams architects design for Esprit Benelux Headoffice is nominated. 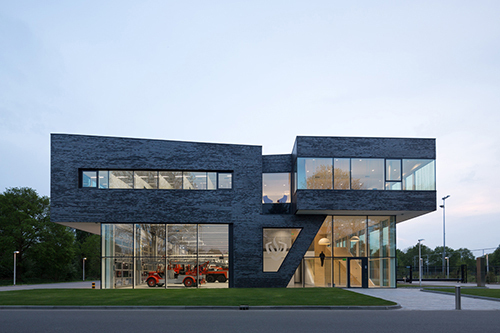 All nominated designs are located in the regio Amstelveen and build after 2009. A distinction is made in housing and other buildings, such as offices and schools. An independent jury, chaired by Indira van 't Klooster - Architectuur Lokaal - made a shortlis wich will be presented in the Amstelveens Nieuwsblad and the website dichtbij.nl. It's up to the public to vote for the best design. After the summer-stop we kicked off with a new challenging project commissioned by Rijkswaterstaat - Ministry of Infrastructure and Environment. 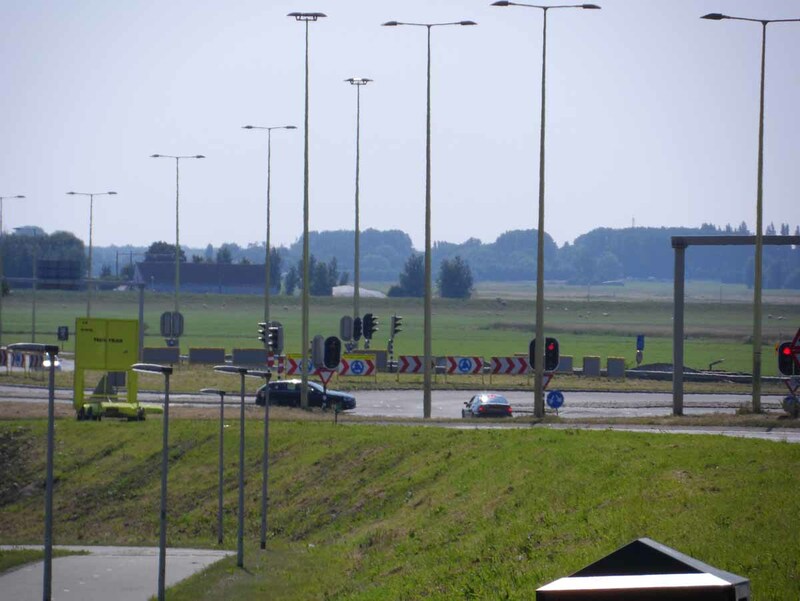 Together with Feddes Olthof Landschapsarchitecten we will develop a spatial coherent concept for the landscape and architectural guidelines for the highway A13 / A16, the new highway north of Rotterdam. The large variantion in landscape of the area brings a variation in use and thereby a large scale of ambitions and oppurtunities. We see opportunities to develop a sustainable and green highway, with new recreational facilities for the adjecent neighborhoods. Friday the 21th of June Bekkering Adams architecten hosted the Korean television crew of EBS for a contribution to their reportage about the value of playgrounds in public spaces and the design for Public Playground. Head of the primary school 'Mullerpier', Hanny van der Heide, and Monica Adams were interviewed. As well as the childeren of the school. Thanks to one of the local residents the film crew was able to shoot some overviews from their balcony on the 7th floor. Filmed material will be shown on the website in November. The design for the School Campus Peer in Belgium, consisting of an elementary school, a high school, a boarding housel and sports complex, is completed to the satisfaction of the client and other interested parties. This month the final design is agreed to and we have started with the next phase in which the building permit will be obtained. The project is part of 'Scholen van Morgen' – ‘ Schools of Tomorrow’ ; a big operation in the region of Flanders to catch up with the modernization of more then 200 currently out-dated school buildings. Under the name 'Scholen van Morgen' – ‘ Schools of Tomorrow’ Flanders is currently experiencing a large catch up in the field of housing of its schools. It is operating from a DBFM – Design Build Finance Maintain approach, and is an iniative to considerably improve the housing of more than 200 schools . In March of this year the first foundation stone has been established. 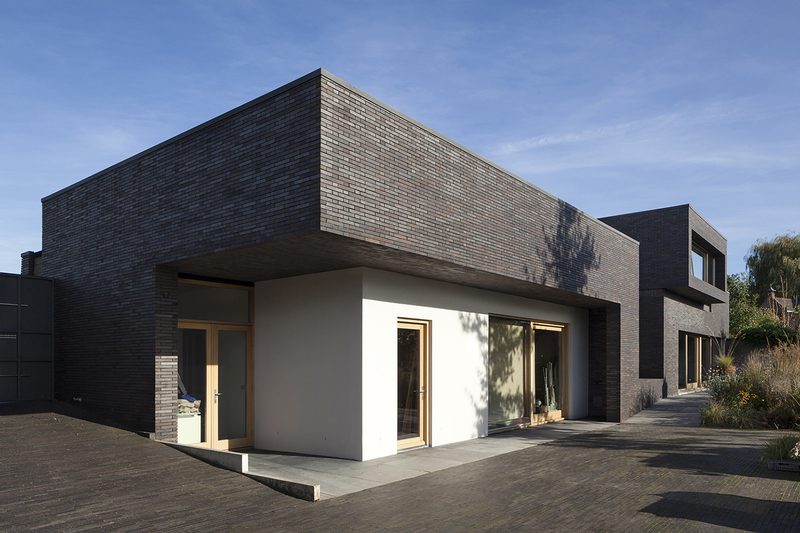 In 2011 Bekkering Adams Architects was one of the first Dutch architecture offices who won a contest organized by Scholen van Morgen for the total design of four buildings together with the surrounding outdoor area. The various buildings with different functions and types of users have their own character. Special care and attention goes to the outdoor area which has been created in co-operation with the Office for Landscape Design B+B in Amsterdam. The park offers room for play and outdoor activities such as basketball, volleyball and football. Thus a central green area is created that is for the schoolchildren as well as for the citizens of Peer. The design team exists of Ingenium for Installation advice, ABT for structural engineering and Bureau voor landschap en Stedebouw B+B for Landscape design. Bureau Boutechniek assists with technical and legislation advice and cost-calculation. 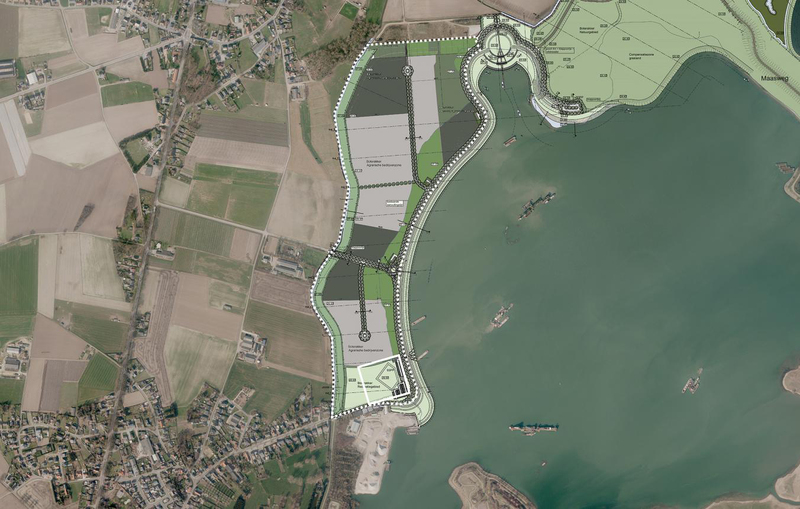 Construction is expected to start in 2014. 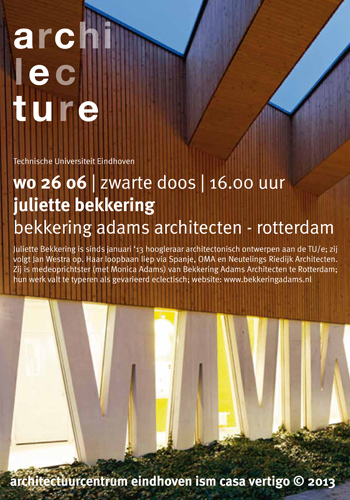 Wednesday June 26th Juliette Bekkering will deliver the last lecture of the series Archilectures before the summerbreak. The lectures are organised by The Architecture Centre of Eindhoven, together with Casa Vertigo of the TU/e. Juliette Bekkering will close the series which started last September with Adriaan Geuze (West 8) and Thomas Rau (RAU). 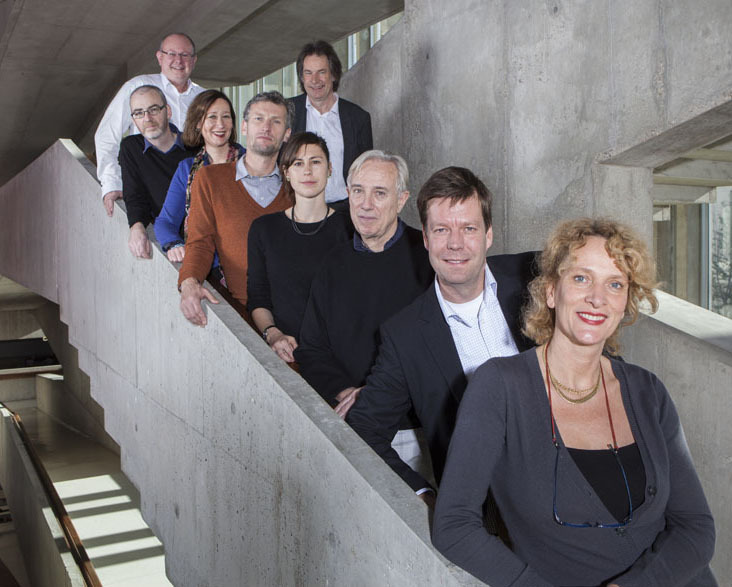 After the Archilectures the nominees for the Dirk Roosenburg Award will be announced. The lecture will take place 26 June 2013. Time is from 16 hrs to 17 hrs. The location is at Bar Zwarte Doos, Den Dolech 2, Eindhoven. The entrance is free. This month the Fire Station in Doetinchem will reach it's highest point. On the construction site the contours of the builing are rapidly growing and the top floor is a fact. Meanwhile the design team is finalizing the last finishing touch to the materialisations, patterns and other design issues of the interior. For more pictures see also this link. 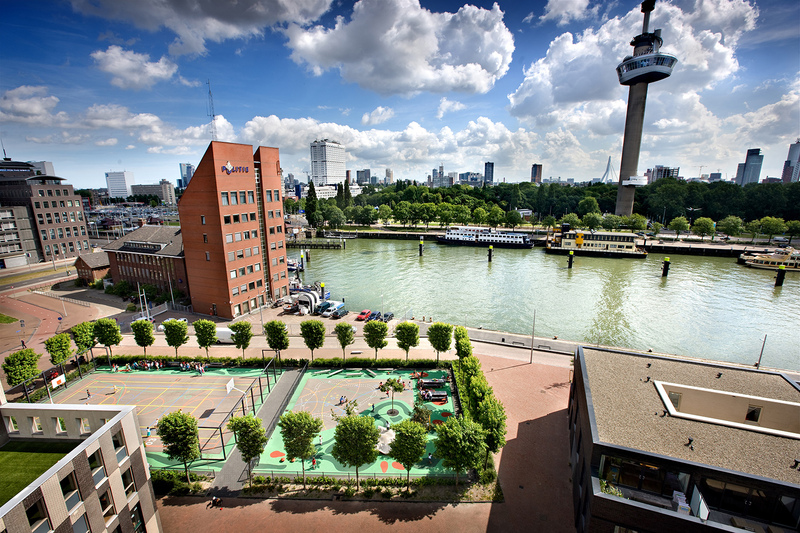 Public Playground, the innovative playground for the preliminary school "Locatie Mullerpier " in Rotterdam, will be featured on Korean educational television (EBS TV). Friday 21th of June the crew will film the square and have various interviews. 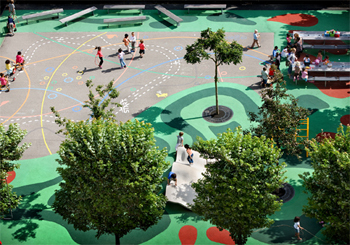 The design of the Public Playground is based on the research of the office into the potential of playgrounds for the public domain. It has been international been widely published in books and magazines. We are proud and happy to welcome the Korean televisioncrew. Theme of Europan 12, the European wide competition for young architects, is The Adaptable City. In this context adaptabillity is the qualitiy of a space that can be easily modified in harmony with the changes to which its use is subject or may be subject. Europe's cities are engaged in a radiacal transformation: they need urgently to reduce their ecological footprint to help resolve the energy crisis, combat the greenhouse effect and preserve nonrenewable resources. Juliette Bekkering will be part of the Europan jury. 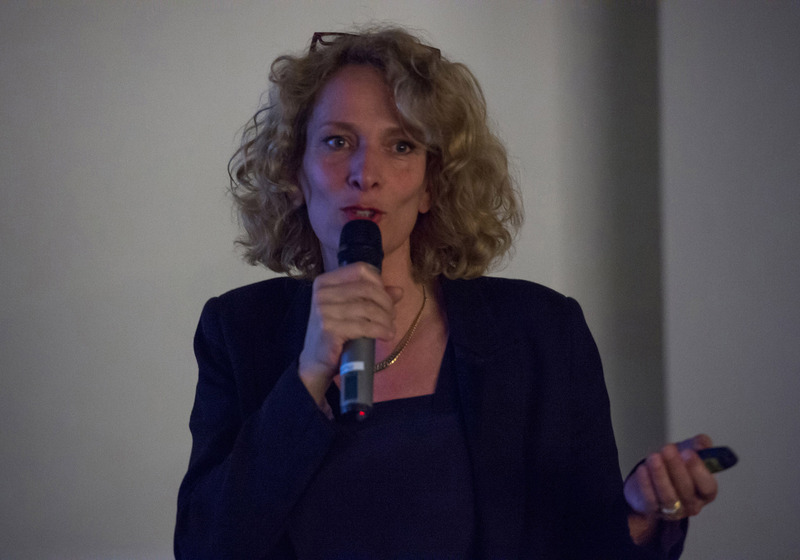 As a member of the national jury Juliette Bekkering will select projects for the Dutch shortlist, and join the Forum of Cities and Juries in Paris for the final selection of winning projects. Friday 13th of December the results of Europan Europe 12 will be announced. The concrete panels of Doetinchem have been placed, looking good! If you like to see at what stage the building activities are right now, check out this link. On 22 february the official ceremony of the start construction of the Fire Station took place.The start of the construction phase was festively inaugurated by burying a time capsule and the unveiling of the building board. These acts were performed by Chief Commander Harriet Tomassen and Councilor Peter Drenth. The building is scheduled to be finished by December this year. See also website Brandweer Noord- en Oost-Gelderland and article De Gelderse Post. At the meeting of the Committee Spatial Quality in Oss the plans for the rejuvination of the center of Oss were presented. Besides the pavilion of Bekkering Adams architecten this comprises of appartments and retail by Diederendirrix, and a new elevation for the V&D retail block by Vocus architecten . 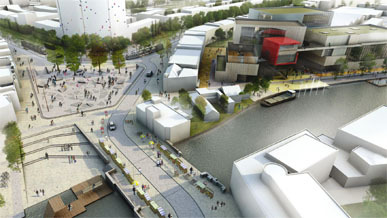 The Masterplan and supervision of the project is by Crepain Binst. The committee was positive about the developments. The municipality will decide before the end of this year if they continue with the revised plans. The preliminary design of all buildings- Secondary school, preliminary school and day care, boarding school and sport complex, has been completed. We are now awaiting the final go-ahead for the next phase. The project, with a size of approximately 18,000 m2, involves the construction of a secondary school, an elementary school, a sports complex and a boarding school. The campus is situated on an area of approximately 5.5 acres in the immediate vicinity of the center of Peer. 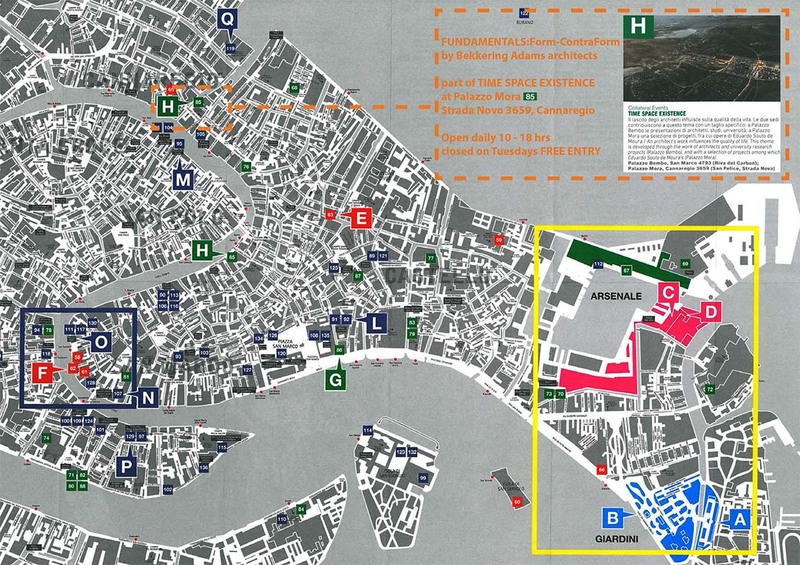 It is intended that the green central area is open to the public and the campus will be of benefit to the town of Peer. The jury praises the concept vision deposited by Bekkering Adams architects. The project is designed as a landscaped urban ensemble, with the sports fields, playgrounds and a large public park as an integral part of the campus design. 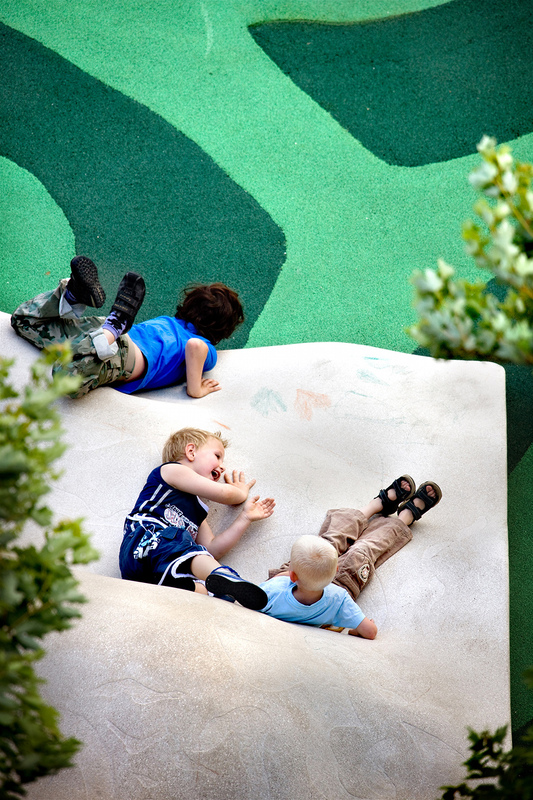 The set up of the various buildings, indoor playgrounds, outdoor spaces ensures a diverse play and learning landscape, where a range of activities possible. The landscape design was made in co-operation with landscape designers Bureau B B. The jury is also enthusiastic about the design of the buildings, which are flexible in design, with common areas for meetings, learning centers and various forms of education. The special rooms in the buildings are designed as expressive accents, and anchor the building to the surrounding environment. An important component is the clear zoning of the buildings, through which multiple use is possible and the campus will be alive during the day as well as in the evening. Through this the campus is anchored in the social and spatial structure of Peer. The competition is part of the procurement process "Schools of Tomorrow". For this competition Bekkering Adams architects worked with a Flemish / Dutch team of advisors: Bureau Bouwtechniek from Antwerp, ABT Antwerp, Ingenium from Bruges, Daidalos / Peutz from Louvain and the Office for landscaping B B in Amsterdam for the design of the public space. The client of the project is the overall organization of "Schools of Tomorrow", in cooperation with the city of Peer. The planning of the project is vigorously, with the start of the first studies in 2012 and the expected delivery of the first buildings in 2015. Lecture Juliette Bekkering in Alkmaar tonight! Zoals de beeldhouwer het standbeeld los hakt uit het monolithisch stuk steen, zoekt de architect, ontwerpend, naar de identiteit van het gebouw, dat nog in de opgave verscholen ligt. Elk ontwerp is een zoektocht naar de identiteit die het gebouw aan moet nemen. Elk gebouw speelt een andere rol in het stedelijk landschap: het ene openbaar en uitnodigend, als zelfverzekerde kloeke gebouwen in het stedelijk landschap met een duidelijke identiteit, het andere juist meer privé , bescheiden en verstilt. Deze zoektocht naar de identiteit van het gebouw en de publieke ruimte is creatief, gelaagd en elke keer anders. In de lezing zal aan de hand van verschillende recentelijk gerealiseerde projecten van het bureau, de zoektocht naar de identiteit van het project geïllustreerd worden. Voor ons is het de uitdaging om gebouwen te ontwerpen met een sterke identiteit, losgehakt uit de ruwe steen. Juliette Bekkering. Today the office received the hard-copy publication of PLAY-Outdoor & Indoor. 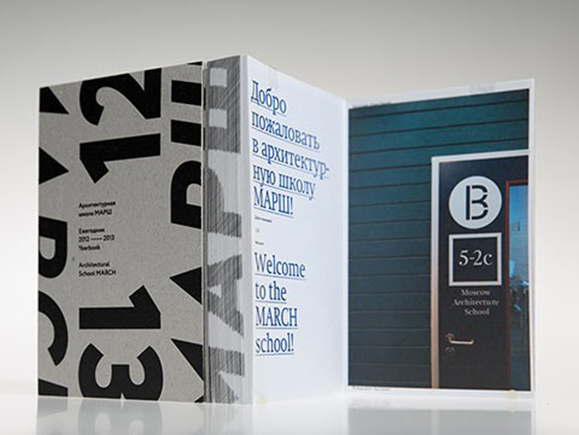 The book shows a broad variation of interesting schools and schoolyards all over the world. We are very happy to be in it with two projects: The vocational school 'De Tender' in Dieren, NL, and the Public Playground in Rotterdam, NL. Hopefully it will be in the bookshelves soon, it is an inspiring collection of contemporary and inspiring environments for children! If you like to purchase the book now, you can order it online via www.amazon.com/Play-Indoor-Outdoor-Sandu-Publishing/dp/1584234369. on November 29th, 10.30 hr. Op initiatief van wethouder Hamith Karakus (Wonen, Ruimtelijke Ordening, Vastgoed en Stedelijke Economie / projectwethouder Zuid) hebben AIR, de BNA kring Rijnmond, Generatie 3.0 architecten en dS+V samen het ArchitectenPlatform Rotterdam opgericht. 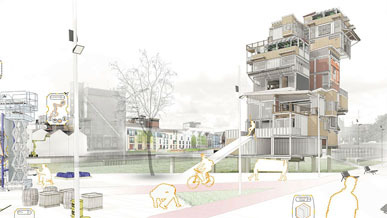 Dit platform komt voort uit de architectuurnota en maakt het mogelijk voor de vakgemeenschap en de gemeente Rotterdam om zaken te bespreken die dagelijks spelen tijdens het maakproces van de stad. Beide partijen hebben behoefte aan een continue wisselwerking over en weer. Het ArchitectenPlatform Rotterdam komt voor de tweede maal dit jaar bijeen. In aanwezigheid van wethouder Hamith Karakus en onder voorzitterschap van Anna Vos vindt nadere gedachtebepaling plaats over het zogenoemde protocol Architectenselectie Rotterdam. Ook het opdrachtgeverschap in de breedste zin van het woord staat geagendeerd. 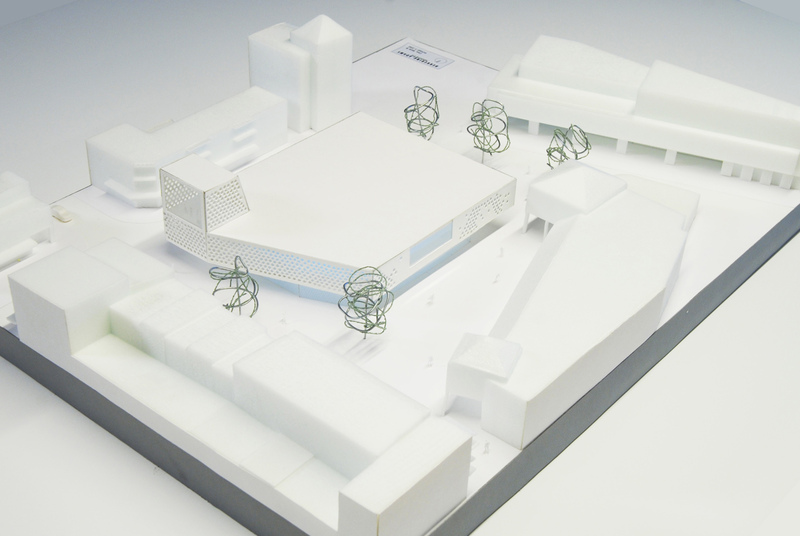 The design for the Firestation Doetinchem is progressing steadily. The Definitive Design will be completed in November. "Energiekonzept mit Photovoltaik, Betonkernkühlung und viel Tageslicht"
The German article concentrates on the Energy concept wit Photovoltaic cells, Concrete core cooling and an abundance of daylight. 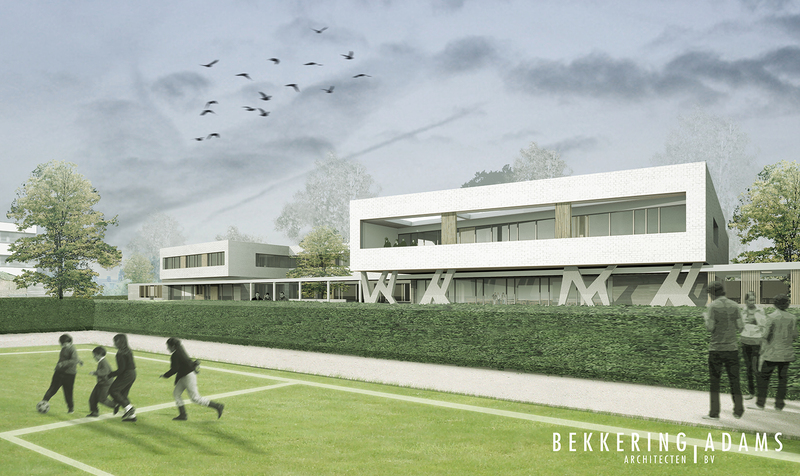 Bekkering Adams selected for the multiple assignment for a campus, with schools, boarding school and sport facilities in the municipality of Peer, Belgium. For this assignment Bekkering Adams composed an experienced team of Belgian advisors to support the office. The competition will be presented in October and the results will be announced in the end of November. 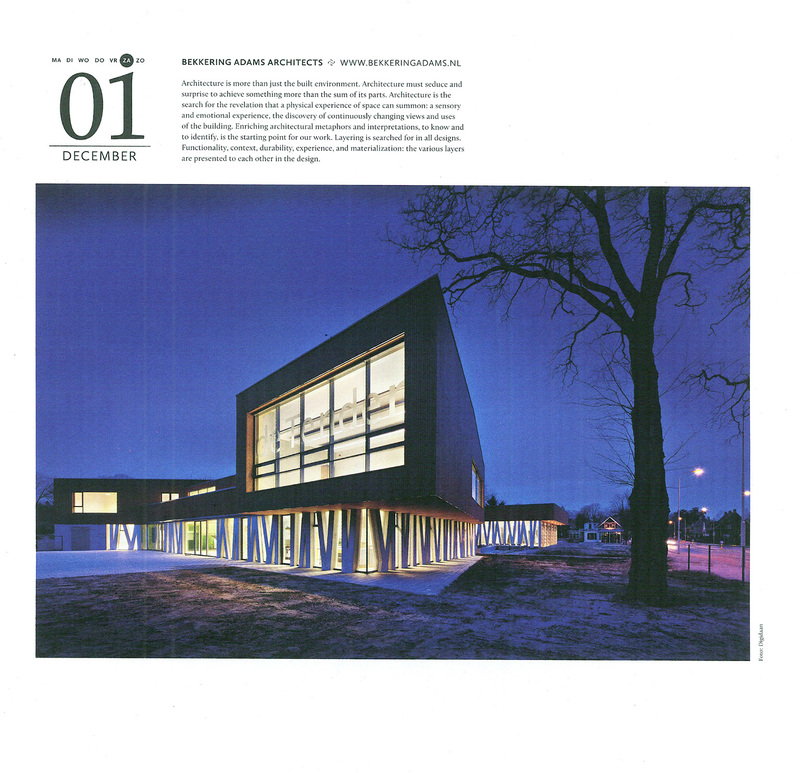 Bekkering Adams Architects is going to be the " Architect of the month" in The Architectural Review: Archiworld. The review will dedicate a 50 page special on recent works of the office. It is expected for publishing in May 2011. The project Bloemershof is published on e-architect. A self-evident urban composition with a strong identity. Sustainability and innovation plays a key-role in the project. 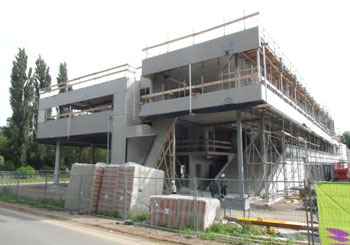 The first building in the Netherlands using concrete core activation with air. The project Bloemershof is published on Baunetz. In German the concept is called:": Gefrorener Wald". This week the project Bloemershof has become operational. The project consists of three buildings with three different users that together form one ensemble: a vocational school, sport-facilities and a fire station. The ensemble is designed as an enclosed courtyard . In the middle zone a green, open and transparent public space, is formed. A large pergola forms the connecting link with the green landscape of the "Veluwe nature park". Sustainability: In the project sustainability plays a key-role. 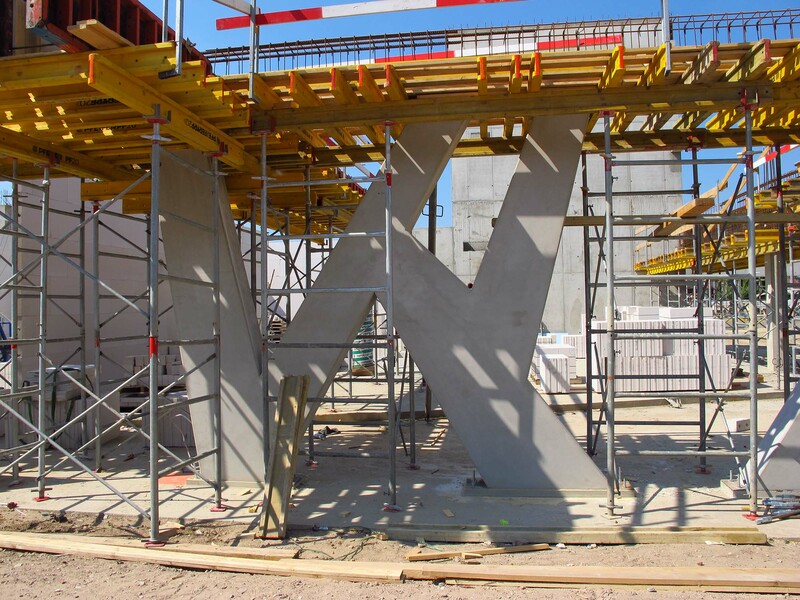 The vocational school 'De Tender' is the first building in the Netherlands where "concrete core activation with air" is applied. The interiors are light and transparent and provide optimum functionality to their future users with a joyous hall and recreation area, a variety of class rooms for the vocational school, a large high space with plenty of daylight for the firestation with surprising vistas to the bar area and training rooms. The sport-facility is elaborated as a light spacious place with daylight. The urban complex Bloemershof in Dieren is almost ready for the users to move into their new premises. Today the Fire Brigade and the Vocational school will get their key to the building. Read the interview in the Dutch newspaper De Gelderlander. Bekkering Adams architecten won the European tender for the new fire station in Doetinchem.Together with Aronsohn (structural engineer) and Royal Haskoning (Installation and building physics consultant) they have been selected as the designteam for the development of the new fire station. Recently, the contract has been signed. Work on the preliminary design has already started, and will be presented to the board at the end of November. The goal for the new building is to design a sustainable and future-orientated fire-station with A label. It is not the first fire station Bekkering Adams architecten has designed. See also Fire station Vlissingen Middelburg (completed in 2005) and the Fire station in Rheden (now under construction). Bloemershof has been published in a two page spread of De Gelderlander titled Bouwplan Volgens Landgoed-concept. The article focuses on the integration of the ensemble in the forresty surroundings and the unique treatment of cooling and ventilation that is being realized in the building. 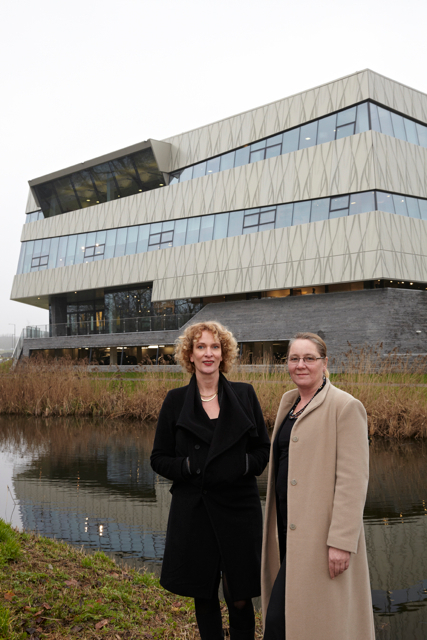 A new set of pictures has been taken of the Schuurman building in Alkmaar. The new day and night shots will be shown on the site. They can also be found on Digidaan.nl. School and child center De Schatkamer opened its doors! Monday 4 March the primary school and child center De Schatkamer has opened. The big central hall immediately proved its function, giving place to all children, parents and teachers listening to the big band. The opening was for the school only. The surroundings of the building are not finished yet due to the cold weather. The official opening will be in autumn. 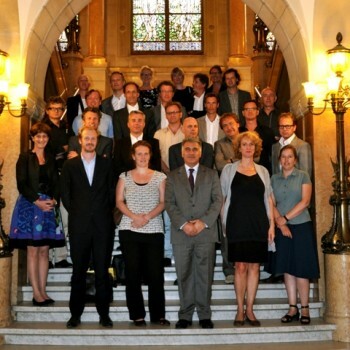 More pictures of the event can be found on the site of the school De Schatkamer. 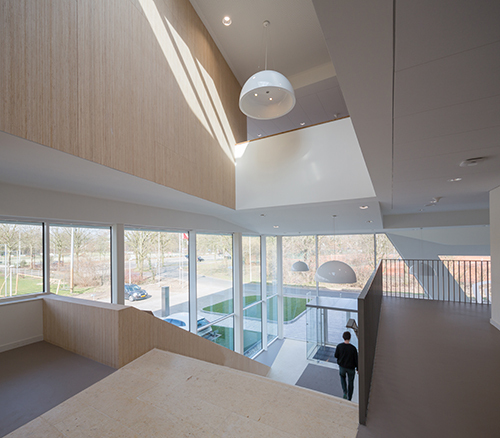 The interior of the primary school and day-care center in Zwolle is almost completed. The school is planning to move into the building in March this year.